2014 is nearly over, which means that it’s time to take a look back at the year that was. I decided to take a look through all my posts and finds and see what stuck out. I present to you the best of 2014, in the form of five different top 5 lists. It’s always nice to get something useful for free! 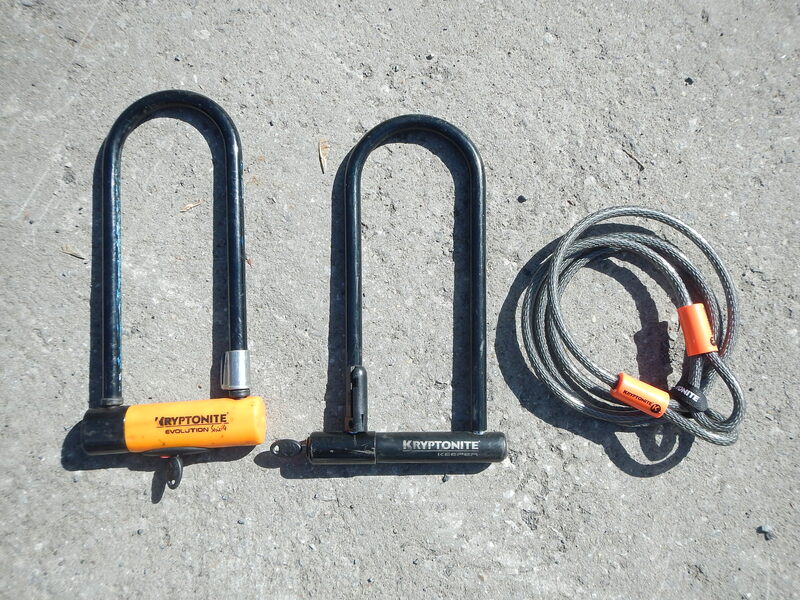 Here’s five things I saved from the dump that I now use regularly. It’s a nice one that probably would have cost 50$ new (and it was pretty much new). I also found a bunch of new batteries in the same pile. Found early November in Westmount. 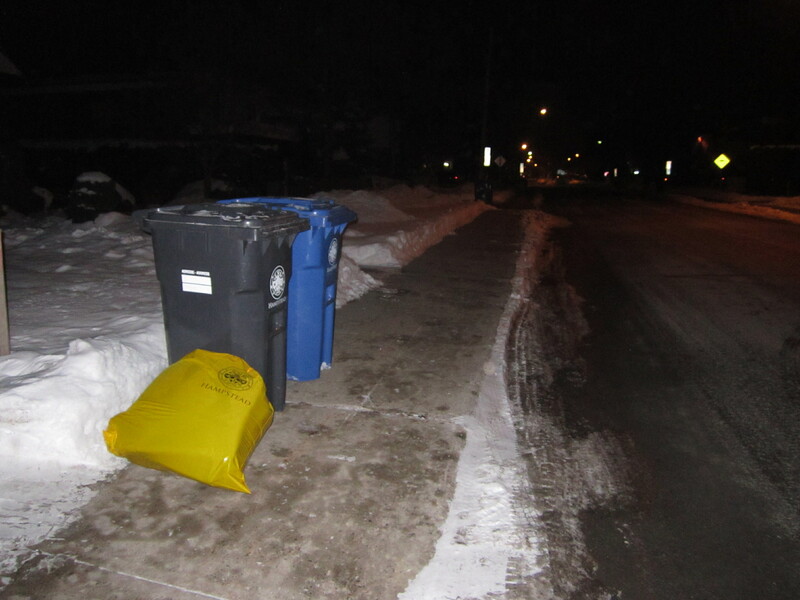 Found over a couple of different garbage days in front of a house in Rosemont (day one, and day two). 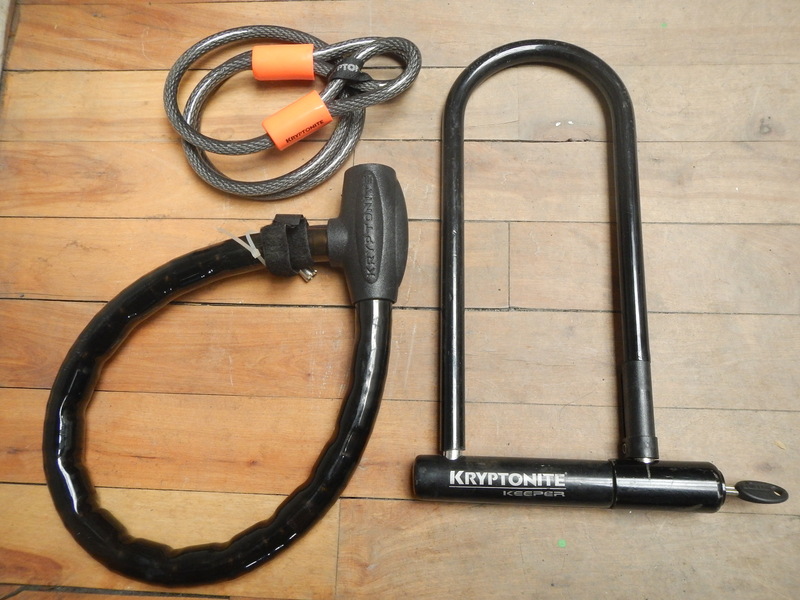 One was a Kryptonite lock that sells new for like 100$. I bike a fair bit, so these are obviously nice to have. Great for storage and also as an attractive decorative piece, I imagine I’ll keep this for quite some time. Found late October in the Plateau. 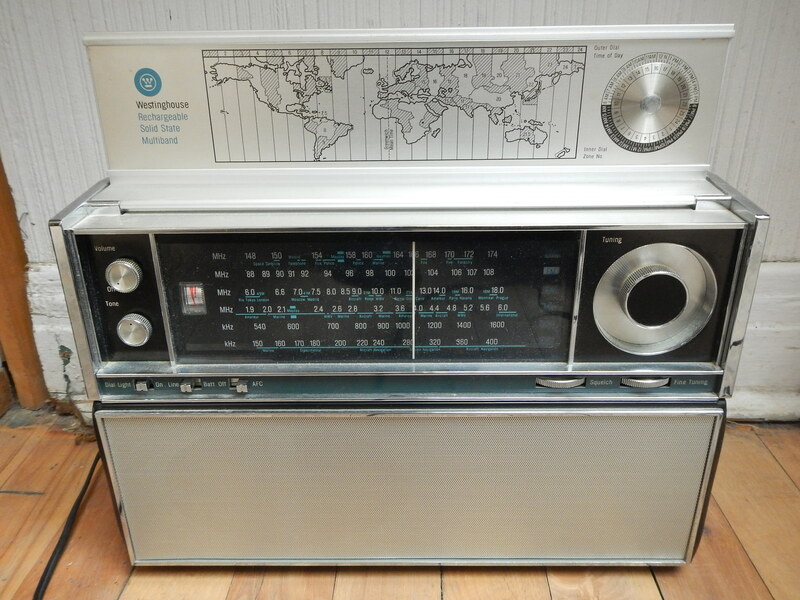 I very much like the look of this radio, especially with the fold-up map of the world and time-zone calculator. It also works great! I listen to the radio a lot while working at my computer, so this thing gets a lot of use. Found early April in Snowdon. I had to buy a new battery and charger to make it work, but this laptop was a great find for me. It’s allowed me to work away from home sometimes, which has actually been really nice. 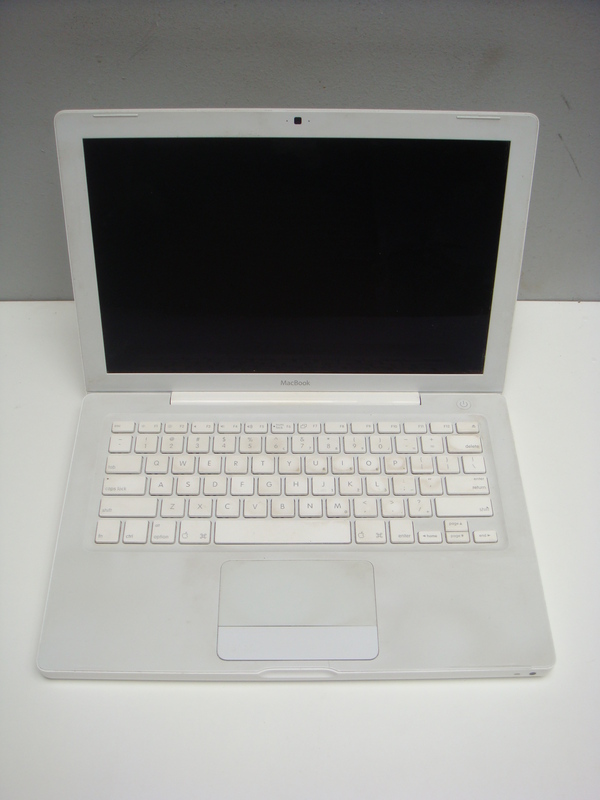 That, and the fact that you don’t find good laptops in the trash on a regular basis, makes it my top useful find of 2014. Found mid-September in Mount Royal. You definitely come across some odd items when looking through trash. Here are five things that are unusual, slightly disturbing, or maybe just a bit mysterious. 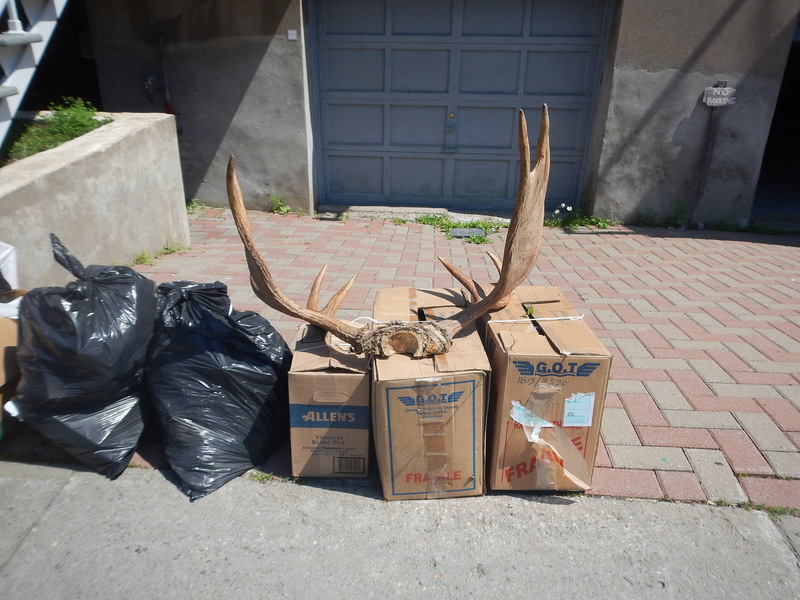 The old woman throwing out these antlers seemed to be happy to get rid of them. Found mid July in St Henri. Status: Now decorating my friend’s house, but still in my possession. I want to try to sell them at some point. 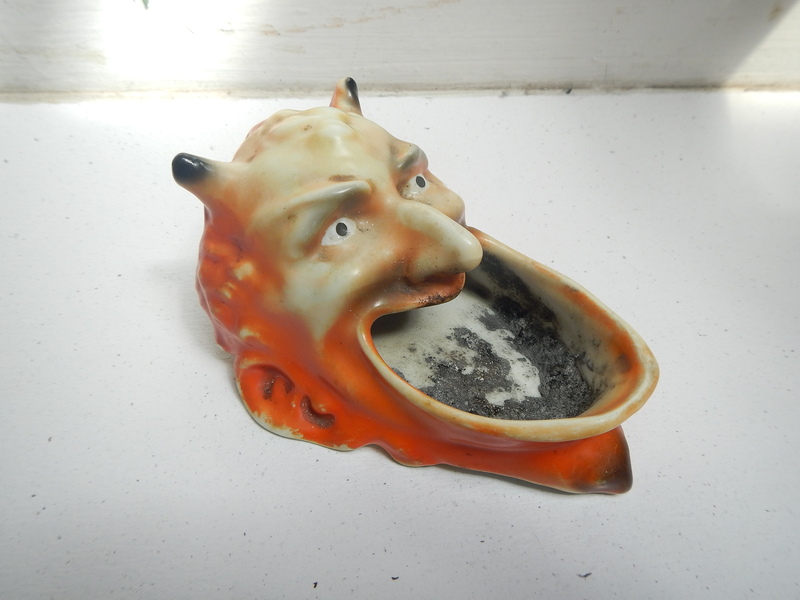 This ceramic ashtray, made in Germany not long after WWII (it was marked “Bavaria Germany US Zone, so between 1946-1949), was definitely an odd one. It was also fairly collectible, probably for just that reason. Found early April in Rosemont. Status: Sold on eBay for 200$, after a little cleaning of course. These were definitely a bit strange. 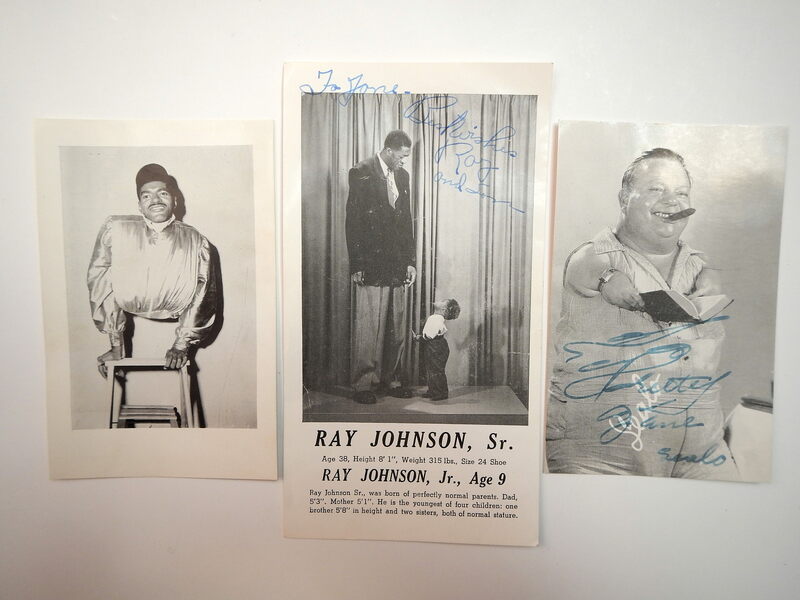 I thought “freak show” events were popular more in the early 1900s, rather than in 1959 when these were signed. Sealo, named for his “seal arms,” was the most famous of these performers. They were signed at Belmont Park, an amusement park in northern Montreal that operated from 1923 to 1983. Found late April in the Golden Square Mile, in the same spot as the Nazi passport. 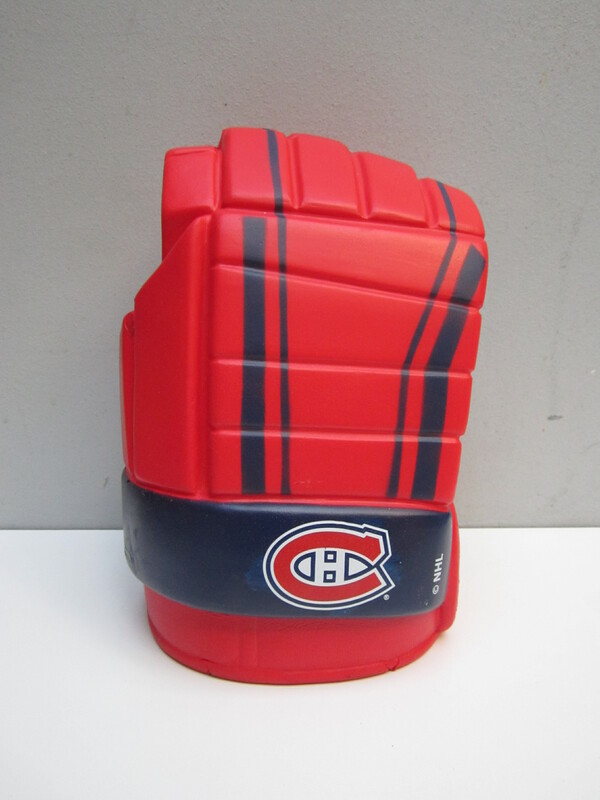 Status: Sold on eBay for 154$. The buyer actually told me they were being gifted to an artist with phocomelia, the same condition that Sealo had, which is pretty cool. These are legit teeth with real gold crowns. Weird, eh? They’re worth a bit of money for the gold content, probably around 40$ to 80$ depending on the karat. Technically I found these very late last year, but since I only posted about them in 2014 I think I can include them. Found in December 2013 the Plateau. Status: Still in my possession (in my collection of odd things). I could melt them for the gold weight, but I feel a bit weird doing so. It’s a really beautiful book, particularly the hand-drawn mosaics on the cover and the first page. That, combined with its age and its unknown meaning, makes it the most curious find of the year. Found early February while biking in Mount Royal. Status: Still in my possession. I like to decorate my space with the things I find. Here are my favourite new 2014 additions, many of which relate to the city I live in. These tend to be somehow beautiful (at least to me), but not valuable enough that I have to sell them. It was really hard to choose something for the number five spot. 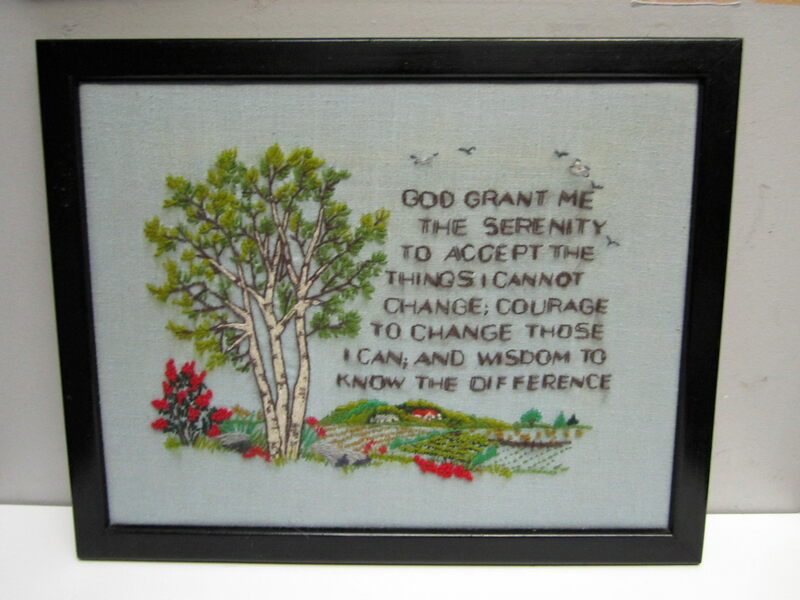 I decided to go with this embroidery of the Serenity Prayer, as it’s something I recently hung up on my wall. I like embroideries, and I’ve always liked that saying. As you’ll see in this list I’m a sucker for anything Montreal related. 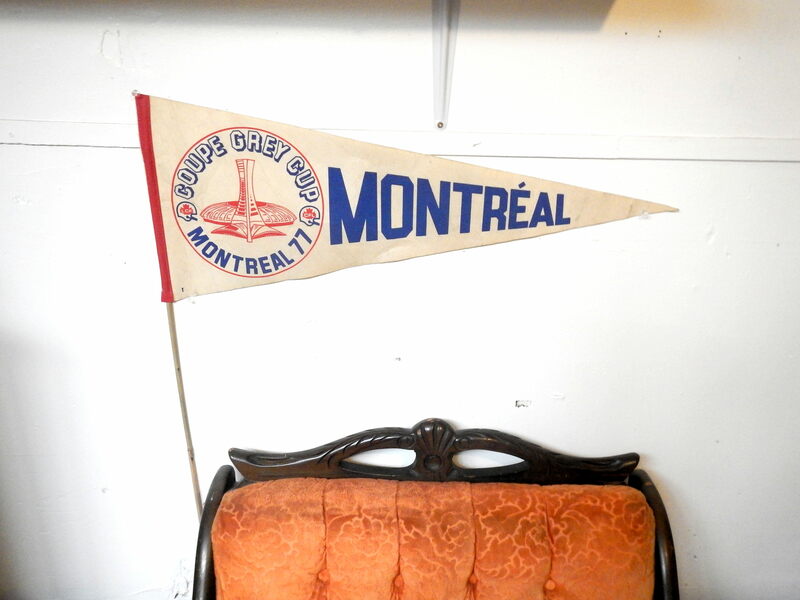 I like this pennant, particularly for the image of Olympic Stadium. It’s currently pinned to the wall above an old spaghetti lamp I found. Found mid April in Mount Royal. 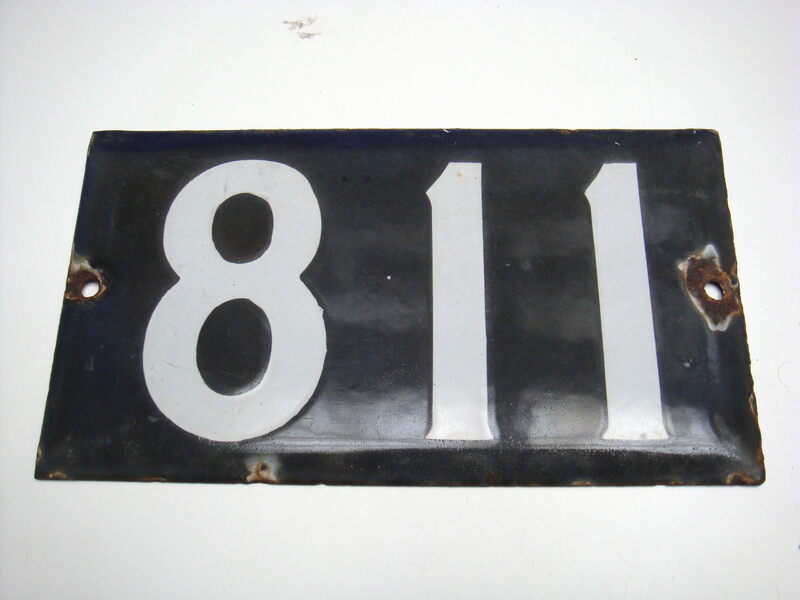 Given my love for history and nostalgia (and again, of Montreal) it was really cool finding my own house number plate! These things are pretty iconic of the city, at least in my mind. I have it hanging above the door to my room and I can’t imagine ever getting rid of it. Found mid September in St Henri. I very much love this piece. 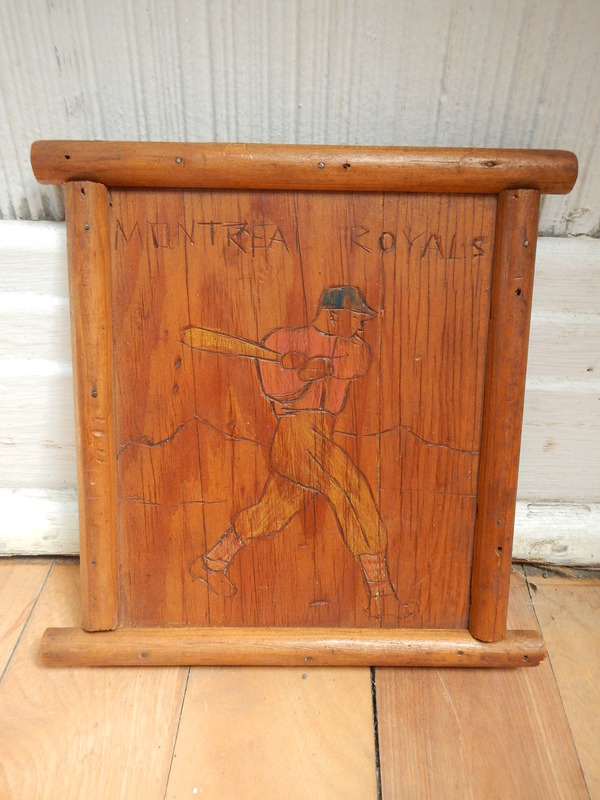 It combines my appreciation of Montreal, baseball, and folk art (it was likely made at a summer camp, or at school) to create a great item I’ll likely hold onto for a long time. Found early April in Snowdon. I found this very beautiful watercolour back in September at the same spot as the 811 number plate. 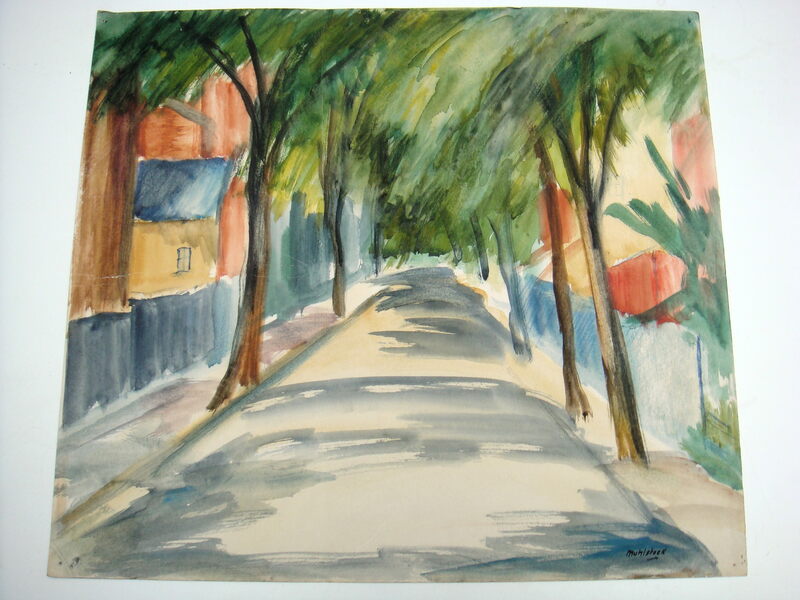 It was signed “Muhlstock,” indicating that it was painted by locally famous Jewish painter Louis Muhlstock. I’ve been meaning to update you on this piece. I contacted the estate of Louis Muhlstock (basically one of his relatives) to confirm the painting’s authenticity, telling him I found it in the trash and had no knowledge of its origin. When he first saw the pictures (he opened the email attachments as I listened on the phone) he seemed excited and thought it was a true piece. Not long later, though he expressed doubt, and ultimately decided he thought it was a fake. Still, I’m not really sure about that. It’s a very nice piece, regardless of who painted it, and certainly looks similar to some of his other work. It has pinholes on the corners and came in a very humble, old frame, which is a good sign that this wasn’t made to deceive. 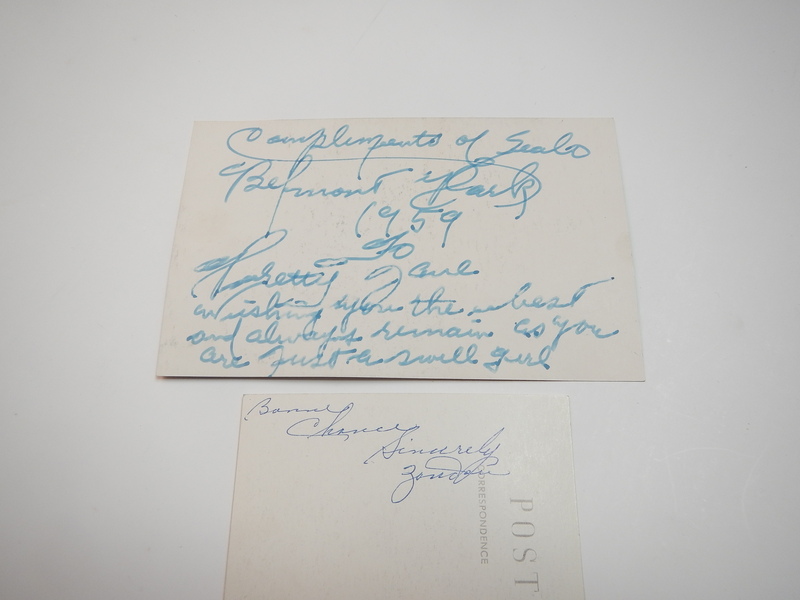 The estate cited inconsistencies to the signatures, but other signatures I saw online showed that there was at least a bit of variance, some of which matched up to the signature on this one. Either way, I can’t sell it as a Muhlstock (it would be worth several hundred dollars in that case), so I’m just going to keep it myself. It’s a great piece that reminds me (again) of Montreal, the whole interesting process of trying to authenticate it, and the fact that finding it indirectly led me to my #2 top find of the year (I’ll tell you more about that later). Found mid September in St Henri. These didn’t quite fit into any of the other categories but are still cool enough to be worth a mention. 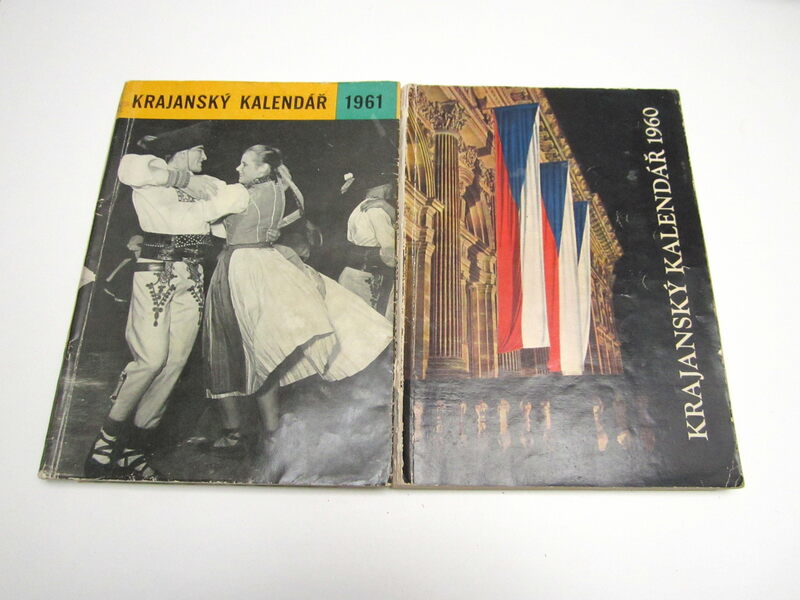 They might be somewhat valuable, somewhat mysterious, or just the #6 best find of the year. I find change pretty regularly – I made about 126.85$ from it this year – but rarely this much at a time. This one place in Upper Westmount decided that the 56.85$ stored away in a cardboard whiskey container just wasn’t worth the effort. Found early December. 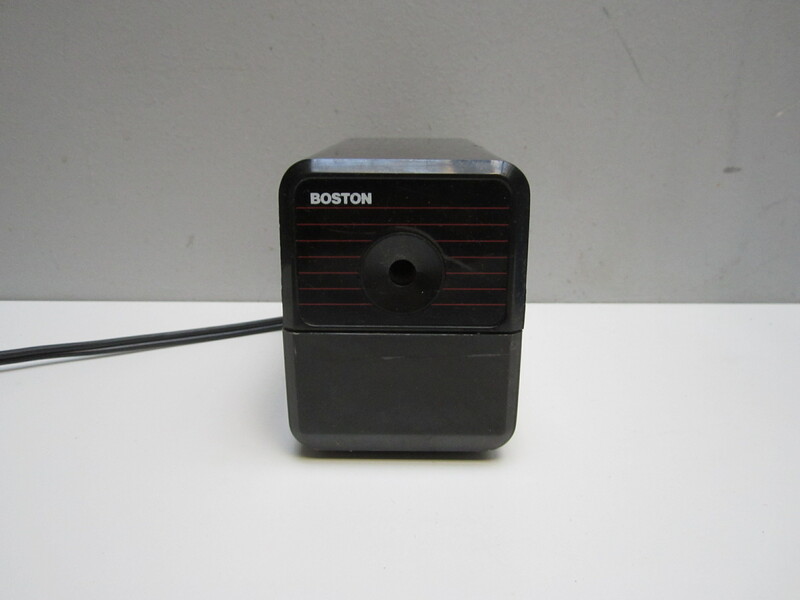 Status: Quickly traded for bills using the change machines at TD Bank, and now long spent. If you told me earlier this year that I was going to find an envelope full of bills, I would have never guessed that the total would add up to 2.50$. 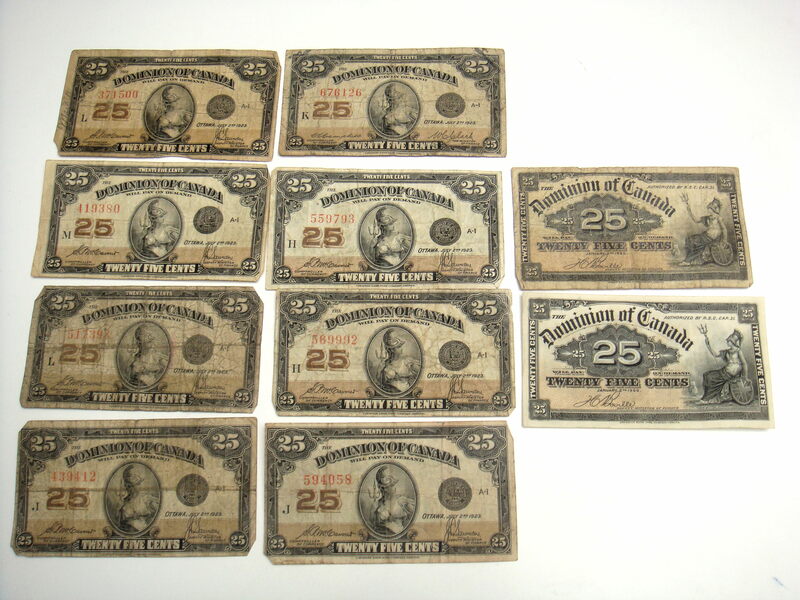 That’s just what happened though when I found ten 25c shinplaster bills from the early 1900s. Found mid September in St Henri. 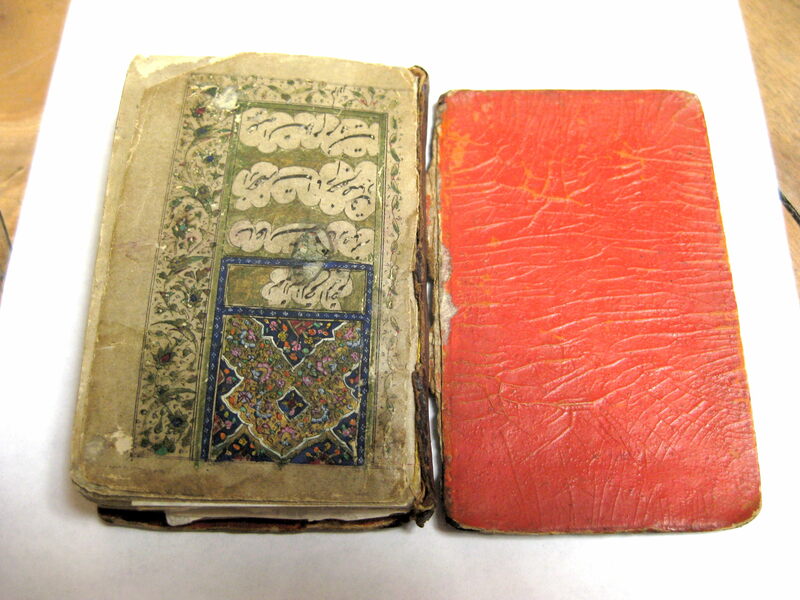 One of a kind and written in beautiful calligraphy, these books could shoot up the list depending on the quality of the contents. Unfortunately, my French isn’t nearly good enough to understand its nuances. 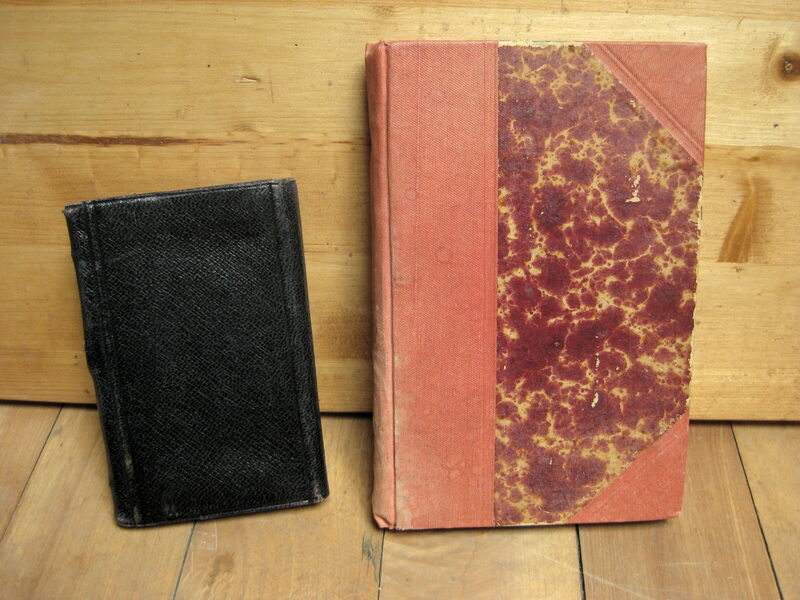 One book is filled with “Poésies d’amitié” (love poems). The other looks to be filled with thoughts on philosophy and religion, and while parts of it are definitely quotes of famous thinkers the rest seems to be original, and fairly poetic. Found early January in Rosemont. 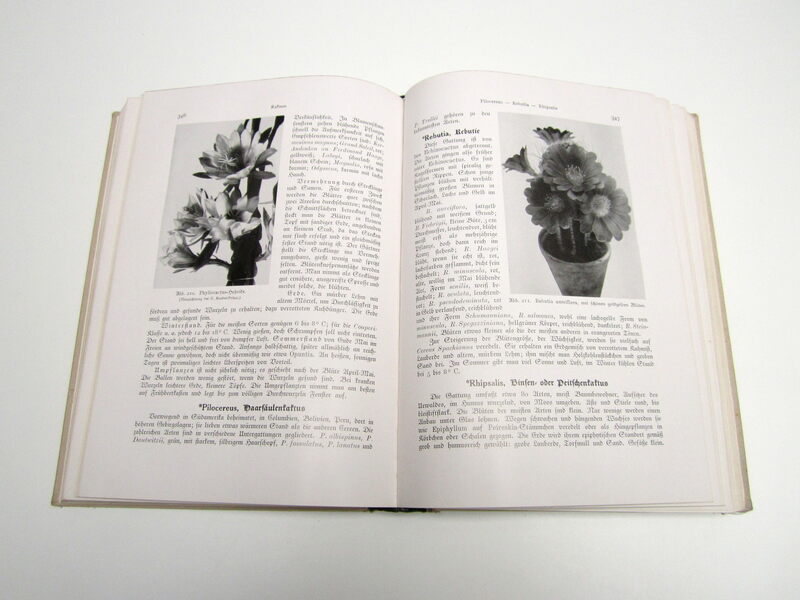 Phone books are quickly becoming a thing of the past, and even in their prime they were generally obsolete in a few years. 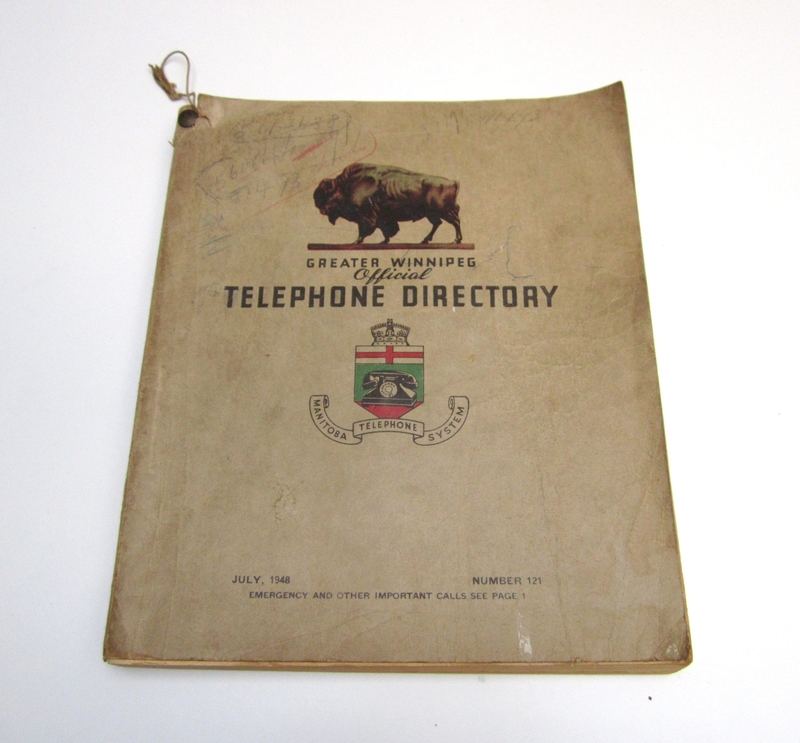 However, someone in Montreal decided to hold onto a Winnepeg phone book for nearly 70 years. I’m glad they did, because it’s a great ephemeral find, a personal favourite of mine. 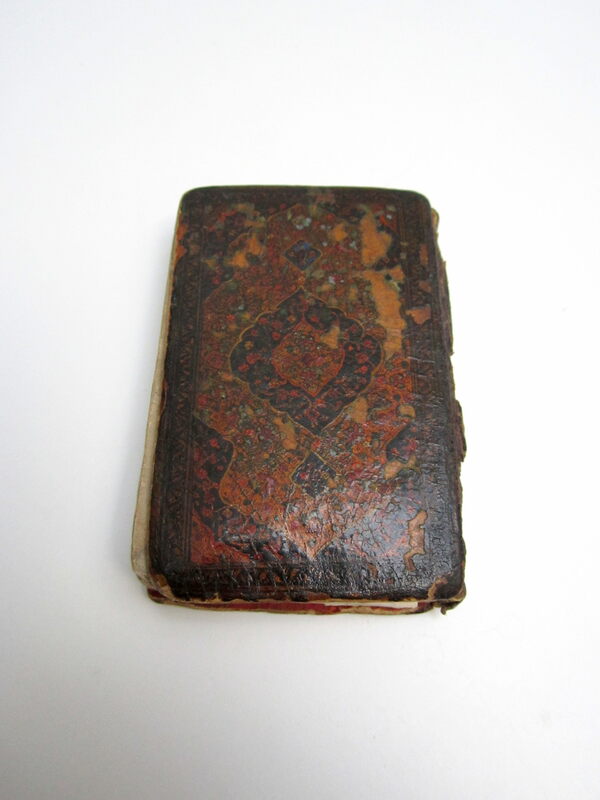 This leather-bound book was in amazing condition considering that it was nearly two hundred years old! 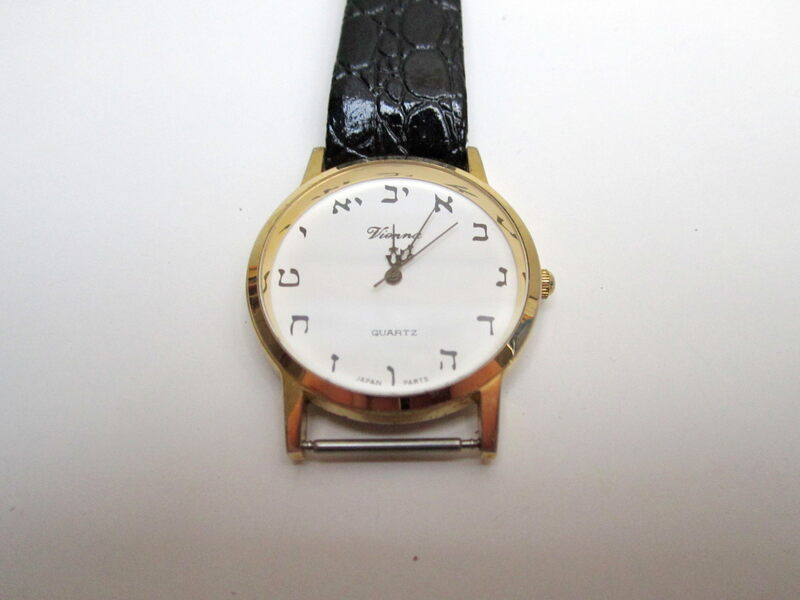 It sold quickly when listed on eBay to a Judaica collector. Status: Sold on eBay for 150$. 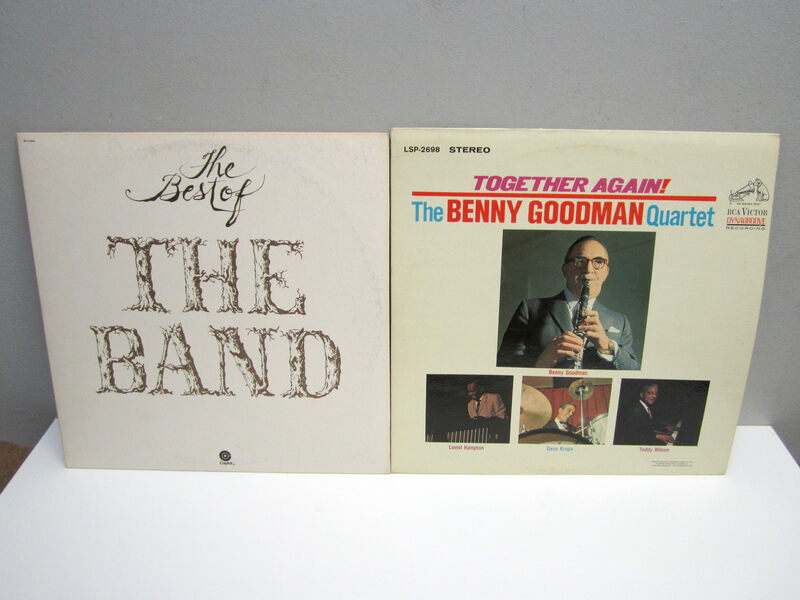 These are the best finds of the year. They all have historical and monetary value. Some taught me things about the past, while others made me feel things I never would have felt otherwise. 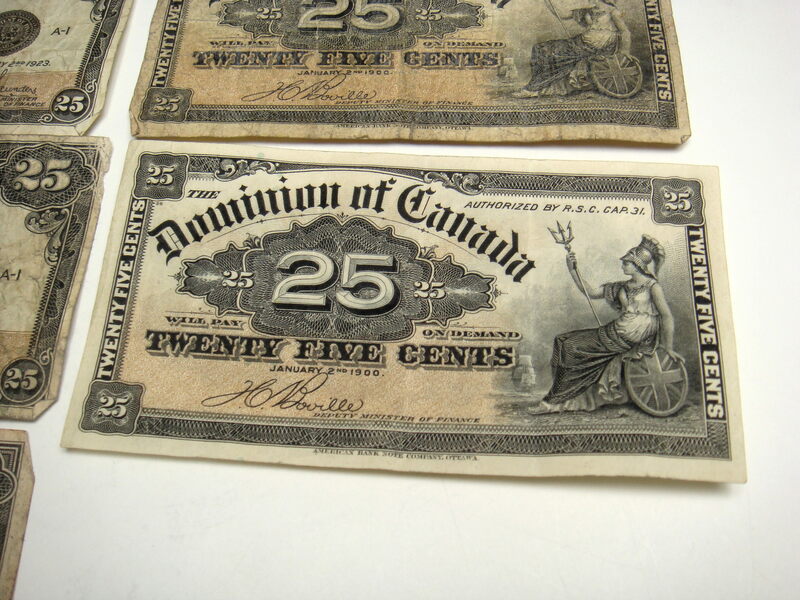 Finding these taught me what Canada’s flag was pre-Maple Leaf. 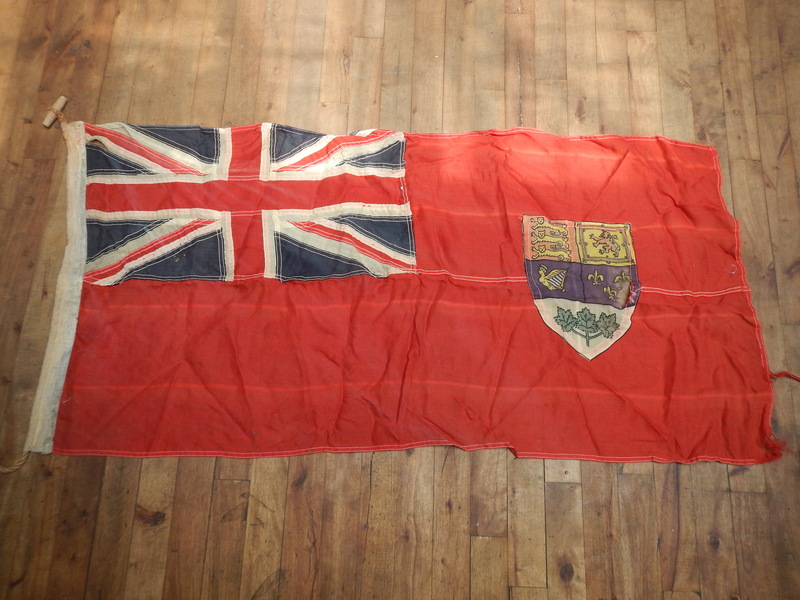 There were four flags in all, two of which were Canadian “Red Ensigns” that served as Canada’s national flag from 1921-1957. There was also an old Australian flag and a one of Switzerland. Found late July in Mount Royal. Status: All sold on eBay. The two Canadian flags went to one buyer for 305.50$, while the other two went for about 60$ each. Buried in kitchen waste, that is! 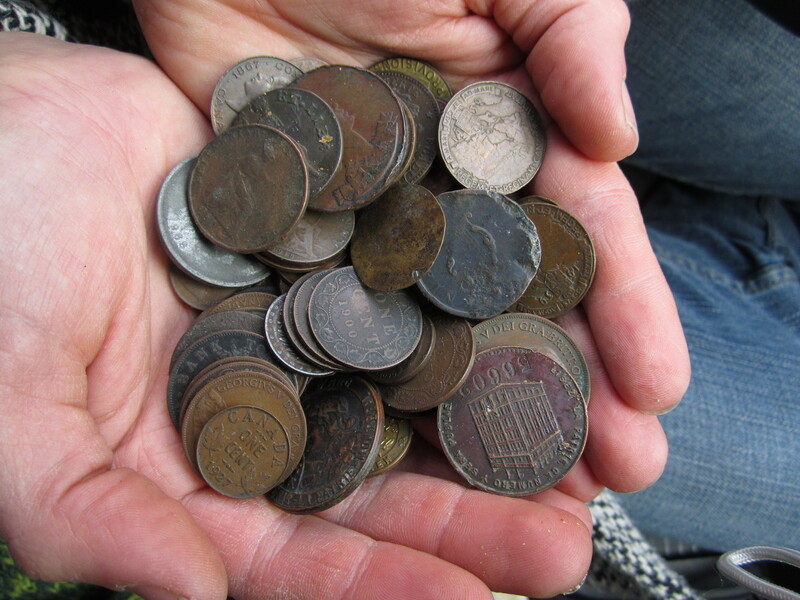 These coins and tokens, some of which date back to the mid 1700s, were for some reason at the bottom of a bag of total crap. It was only thanks to my kicking the bag – and hearing that familiar jingle of coins – that I found them at all. There were also a few ripped up photographs in the bag, which makes this all slightly odd. Found early December in Verdun. 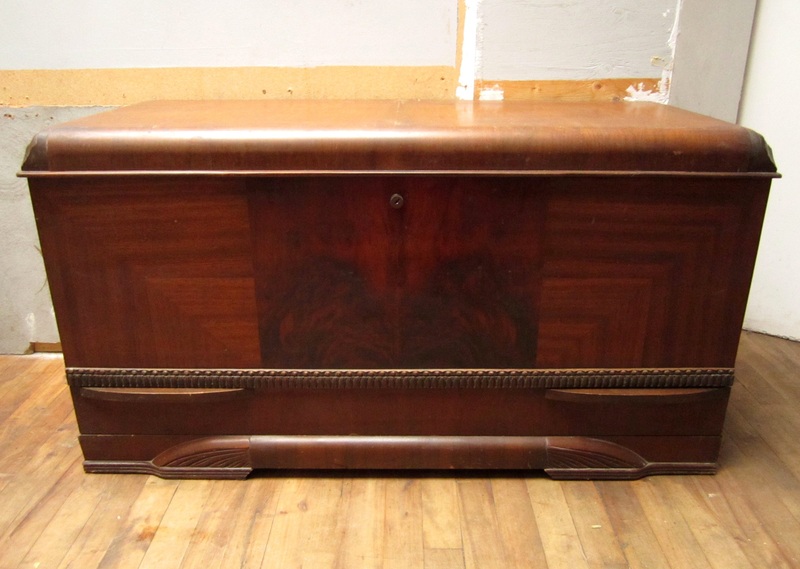 Status: In my possession and awaiting listing. The most valuable is likely a late 1700s coin American stamped “Nova Eborac” (New York in Latin). If you want a closer look at the coins, I added a special gallery to my Facebook page. I found these all in the same place, so I think it’s fair to list them as a single find. They were all in great condition and perfectly packed away in aged boxes. My guess is that someone inherited them and some point and just didn’t know what they had. The majority are made by Aynsley and Paragon, brands renown for their quality. Status: Most are sold or listed on eBay. I’ve already made over 1000$ dollars from the collection, much of which came from a set of three uncommon cottage-themed cups by Aynsley that sold for 750$ (top left photo of gallery above). A set of three turquoise Paragon “rose” cups sold for 180$, while a similar green set sold for 170$. This just goes to show that keeping your eyes to the curb can occasionally pay off in a big way! Found early October in Ville St Laurent. This would have been an easy #1 last year, but there was stiff competition this time around. 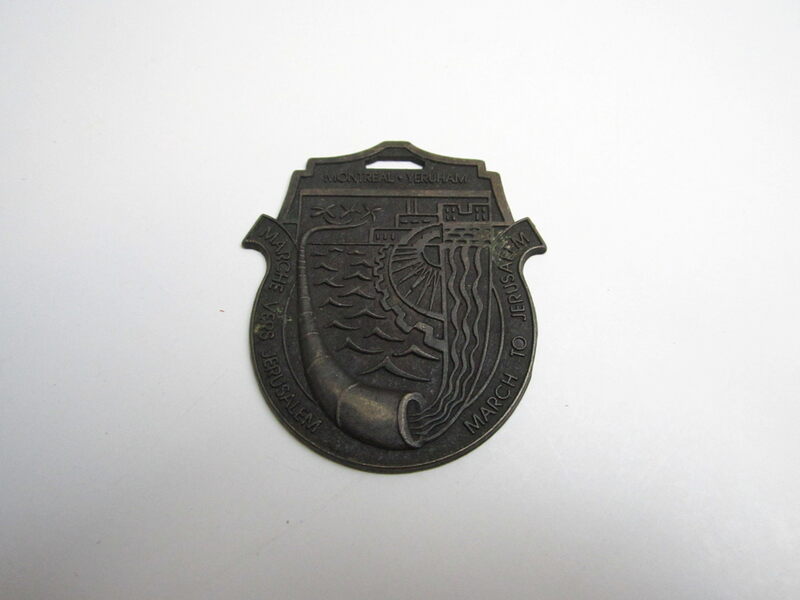 This medal is a great piece of history, with World War I ending nearly 100 years ago. 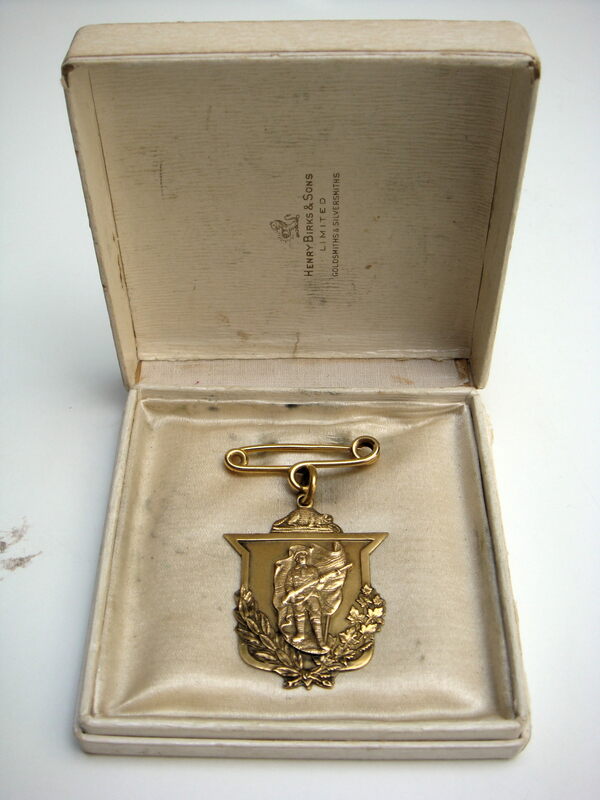 It’s beautifully crafted in 10k gold, and the note that accompanied it gave it the context I often spend so much time trying to discover (“all the Plumas boys who served and returned got one of these”). I also came across it quite luckily. I had found the Muhlstock painting while randomly driving around St Henri (an area I had never covered) on a non garbage day, and decided to come back on trash day for a real run. The timing was impeccable, as I found this medal on my first St Henri run. 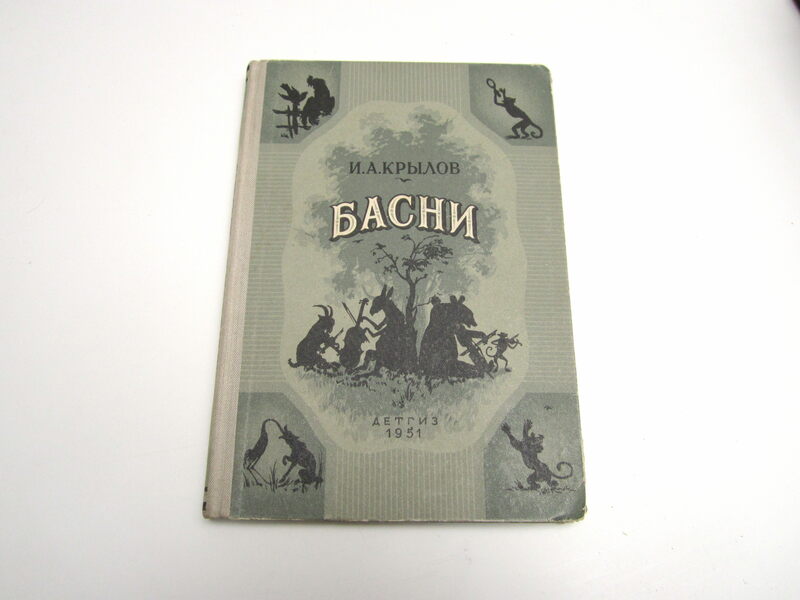 Status: Sold on eBay for 290$. I think this may have been the easiest choice of them all. It’s simply an amazing find that carries all kinds of historical and spiritual weight. 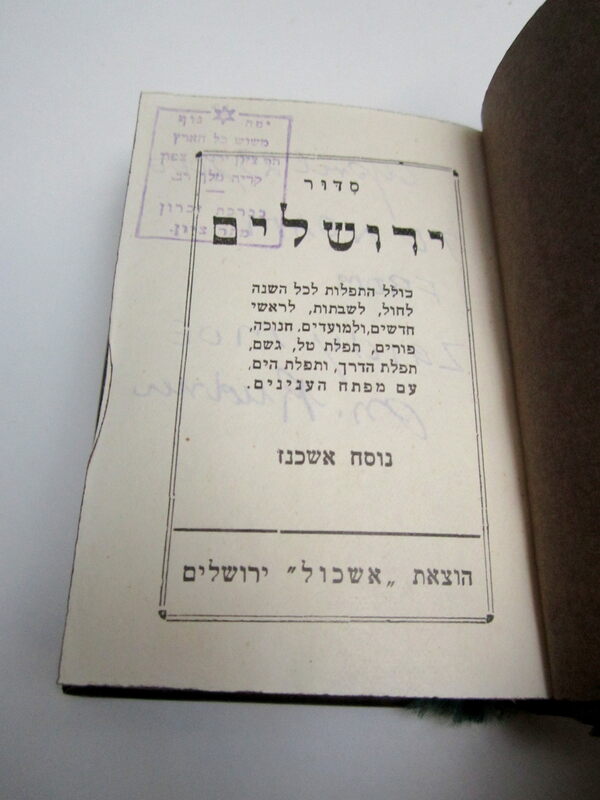 The “J” stamp in particular, which the Nazis used to mark Jewish passports, makes me ponder hatred and the power of bureaucracy. 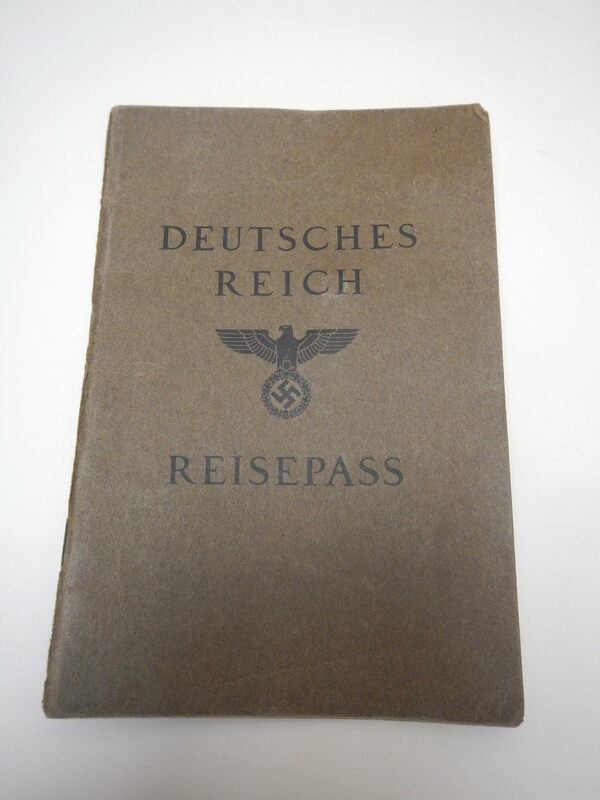 As well, the date of departure – July 3rd, 1939 – highlights how lucky it was that this woman escaped Germany before the war broke out on September 1st. By then, it would have likely been too late. Documents like this have power because they make you feel things that you might never have felt otherwise. Intellectually, I knew many things about WWII and the holocaust from school and reading. However, seeing this artefact and feeling it with my own hands makes that ugly history feel much more real, and somehow closer to home. I hope I was able to share that you with you as well. I was extremely lucky to find this at all. I happened to be in a part of town I don’t usually cover for an appointment, and I found it long after most garbage is long compacted. The circumstances make it an even better find, and it’s an easy choice for #1. Found late April in the Golden Square Mile. 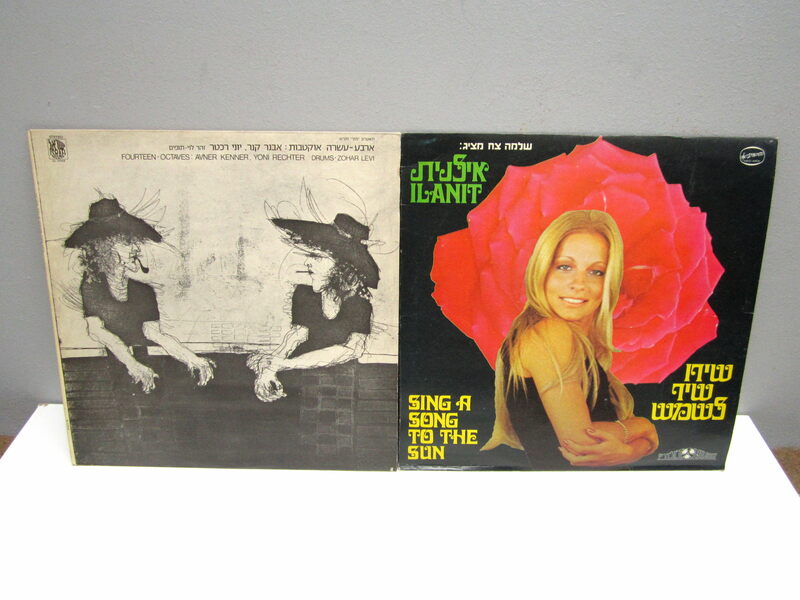 Status: Still in my possession along with many of the other amazing things I found at the same place. I contacted the local holocaust museum about it, but they said they have five already and I didn’t see a point in giving them a sixth. I’ve considered selling it, but I wouldn’t want to sell it to just anyone. I prefer to keep it myself, selling it only if I am ever desperate for cash. It’s something I can show my friends, and maybe my kids or grandkids someday. My first full year as a professional scavenger was a great one. I found lots of amazing stuff, made a few more notable media appearances (including one on Definitely Not The Opera, a radio show that plays nationally here in Canada), and improved as a businessman, blogger, and scavenger. I’m excited to see what the new year brings! I would like to thank all of you, my readers for being so supportive. The blog now has nearly 3000 followers and your interest is a big part of what keeps me motivated. 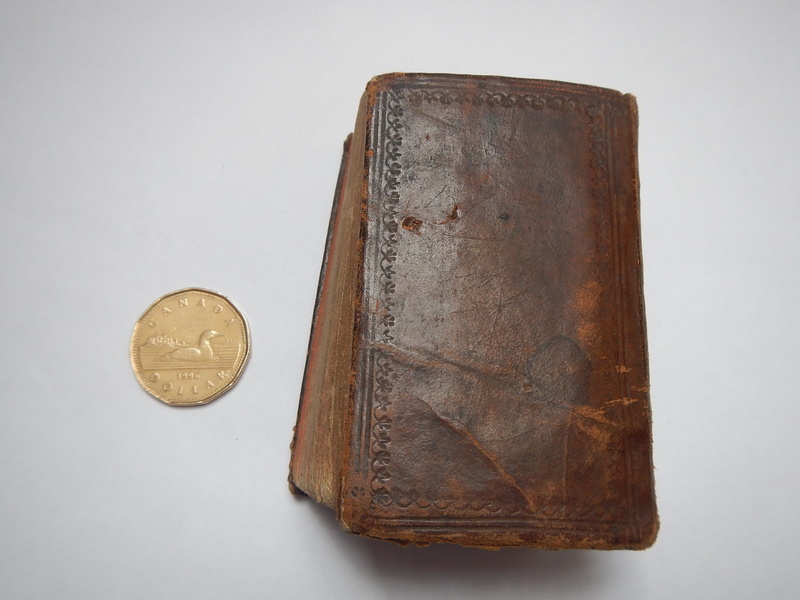 It’s a lot of fun sharing my finds with you and I always enjoy reading your comments. I would like to extend an extra special thank you to my friend Sarah for her unconditional support. Not only did she inspire me to start this blog but she also let me use her car and fill it with trash all year long. Without the car I would have missed out on many of my best finds. I hope you all have a prosperous and happy New Year! 2014 is nearing an end! That means it’s time for me to look back on my first full year as a “professional scavenger.” I’m working on a year in review-style post, which should appear either tomorrow or the 31st. It’s been fun looking at my old finds, and remembering things I had previous forgotten. I hope you’ll enjoy it too, and maybe see some cool things you had previously missed. I didn’t get out much last week because of the holidays but still managed some good finds early in the week. I stopped at this spot in Hampstead Tuesday night. 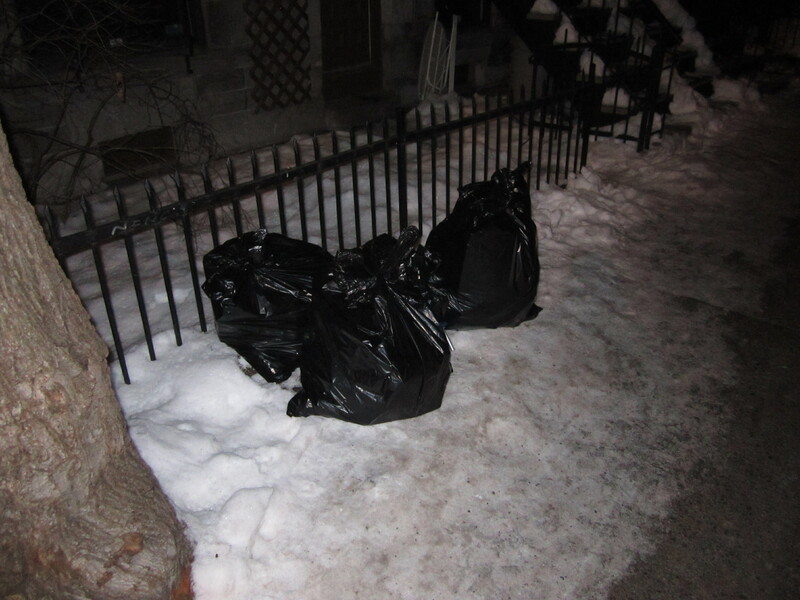 There were originally three yellow Hampstead garbage bags on the curb, but I sorted through a couple and left the remainder in other nearby trash bins. It looked as if someone around my age came home for the holidays and sorted through their old stuff. There were a few items that reminded me of my younger, pre-university school days. 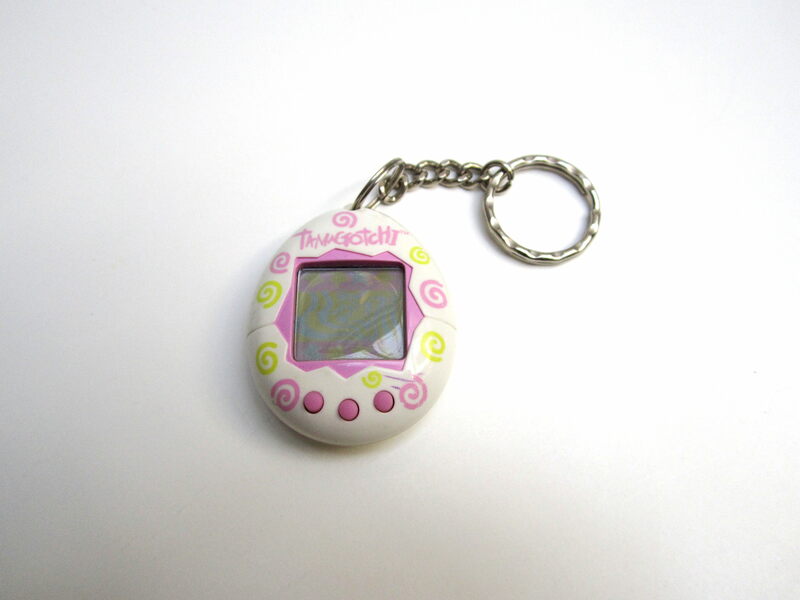 There was a Tamagotchi, for one. 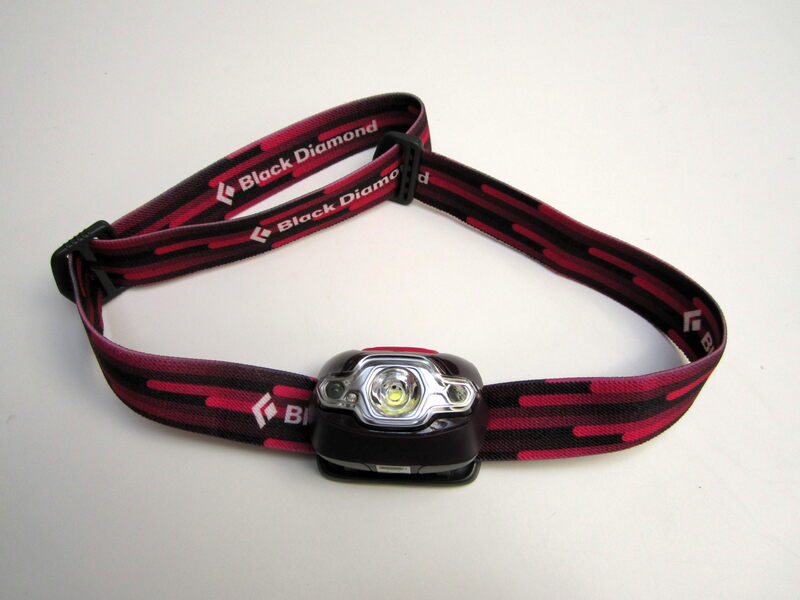 These were all the rage in the late 90s! I never had one personally, but I remember a lot of other kids having them. 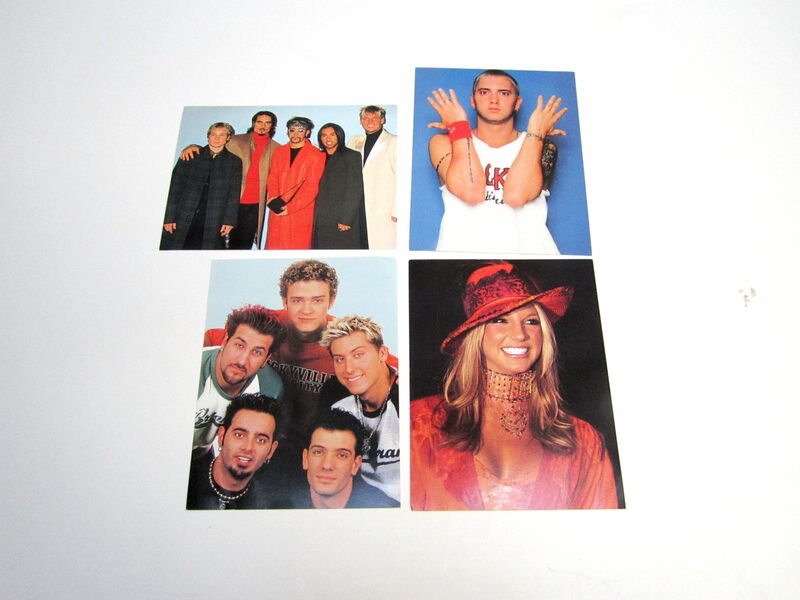 There were also several photos of celebrities distributed through J-14, a teen celebrity gossip magazine. Whoever this was really liked Eminem – there were several other photos featuring him. They also liked the Spice Girls. This sticker collection definitely has some kitsch value, if not much monetary value. Most useful for me in a monetary sense was the jewelry. 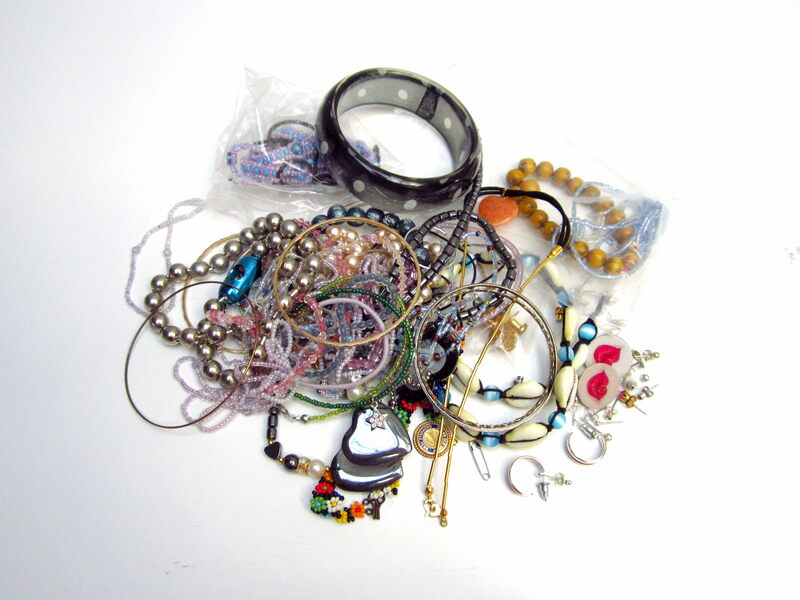 Much of it wasn’t particularly special but there were several pieces of sterling silver, including: four rings, a pair of earrings, a chain, and a few other pieces that are destined for the scrap pile. 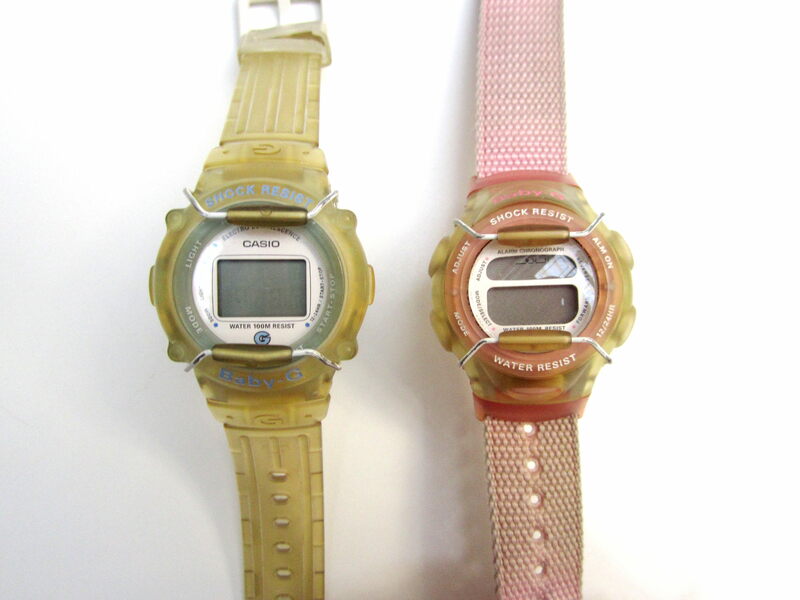 … as well as a couple Casio “Baby G” watches. I have a whole bunch of watches sitting around at home, some of which are quite nice and could fetch some decent cash. I don’t know much about watches, but from my experience they often just need a new battery and that’s easy enough to do. I decided to get a few tools to help me fix them: two different types of screwback openers, and a bunch of different sizes of batteries (made by a reliable brand). It all cost around 25$, but I think it’s a good investment. Otherwise, I saved a Montreal Canadiens “Game On” beer-holding glove and a couple of old tickets to Canadiens games (including one to a 2002 playoff game). I’m sure someone would buy these things off me at a yard sale. I took a run through Cote St-Luc on Sunday night. I stopped at one place that had put several bags to the curb. The bags were mostly full of junky stuff, but I saved a few interesting things. I noticed some tarnish on this piece, and despite it being unmarked an acid test confirmed it to be made of sterling silver. It looks to me like an incense burner. The top is ordained with a butterfly (unfortunately missing an antenna) and has several holes in it. 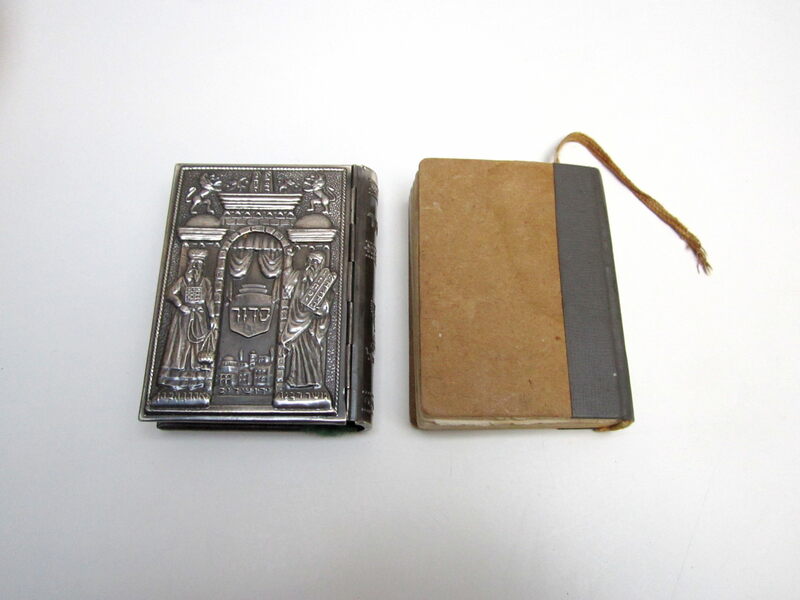 It’s also hinged, opening up to reveal a small space for incense (or so I presume). It has a few dings, but it’s very nice and should sell for a decent price! 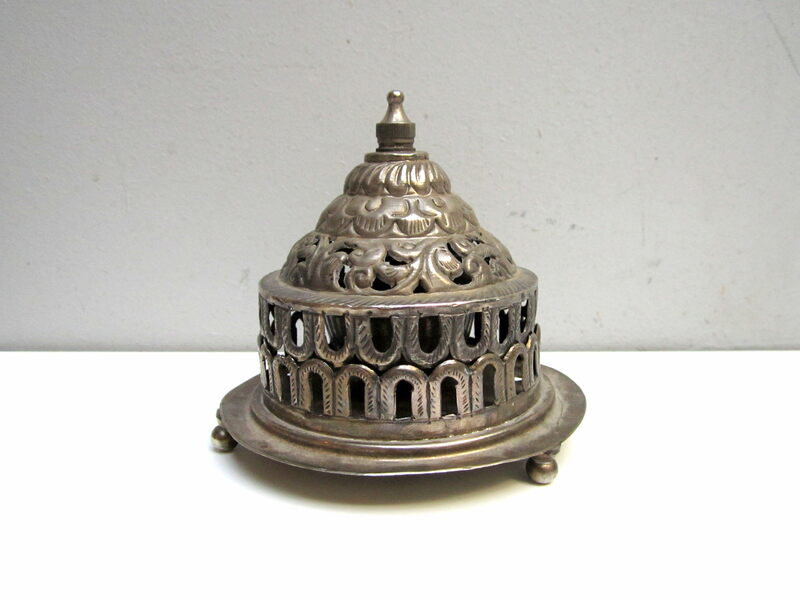 This also looks to be an incense burner. I wonder if it’s missing a piece. The top and bottom seem to match up pretty well, but sometimes it’s hard to find the sweet spot where they fit perfectly. This is an odd piece. 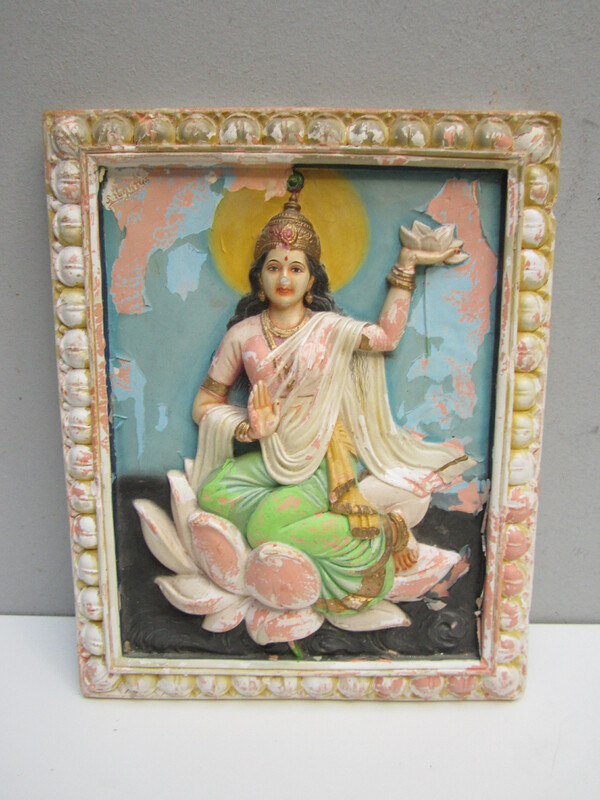 It seems to be chalkware (made of plaster or gypsum), which was popular in the early 20th century. 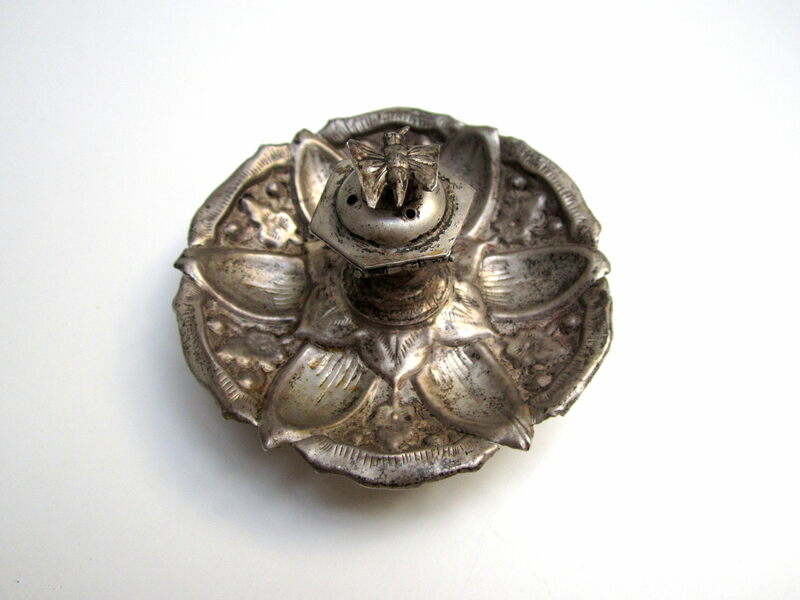 However, it features an Indian design – I had before mainly seen Christian chalkware pieces. 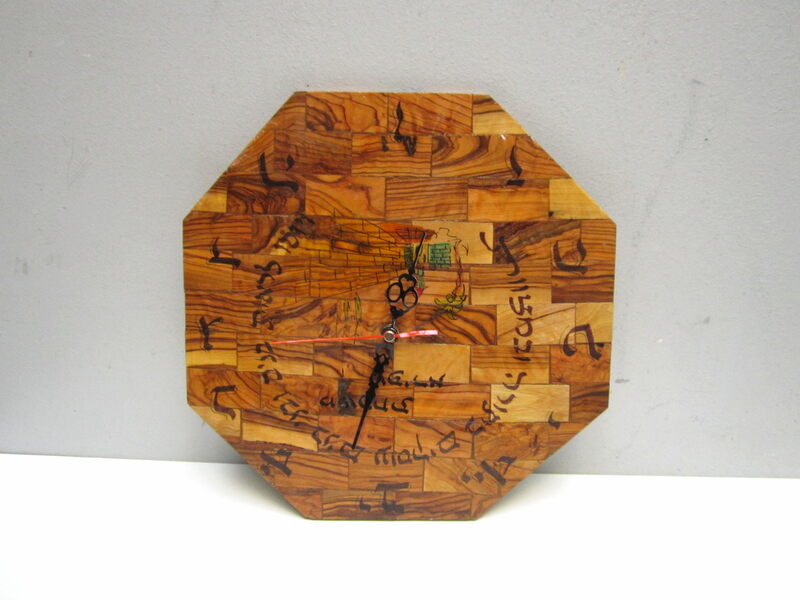 It seems to be signed Satguru’s, which could be this company in Mumbai that’s been making art since 1948. Still, I haven’t been able to find anything quite like it online. The paint is chipping pretty badly, but it’s still pretty cool. I went to Mount Royal on Tuesday night but came away totally empty-handed. I think people were busy getting ready for the holidays and didn’t have time to toss out the good stuff. I’m excited for this week though! Maybe people will throw out their old iPhones after getting the brand-new model for Christmas. 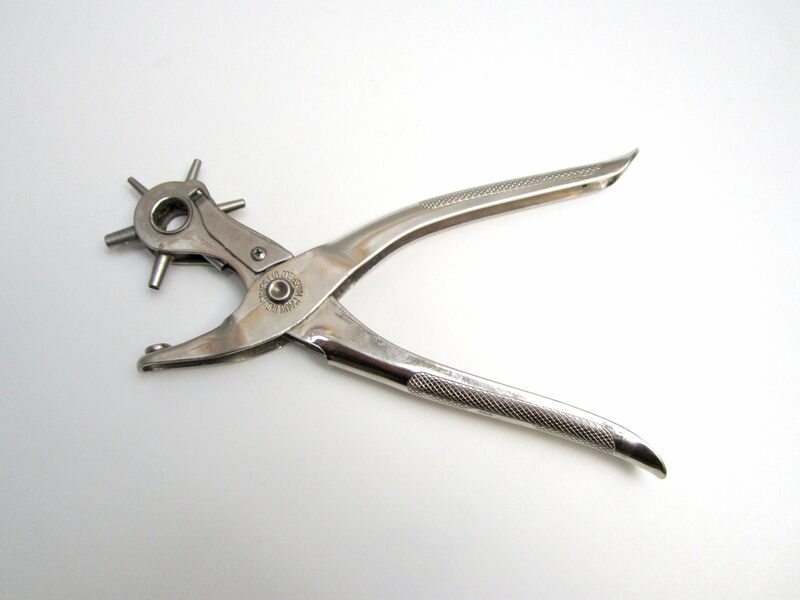 I didn’t find that much after the last holiday season, but I’m also now a much better (and more mobile) picker. I’ll let you know how things go this time around! 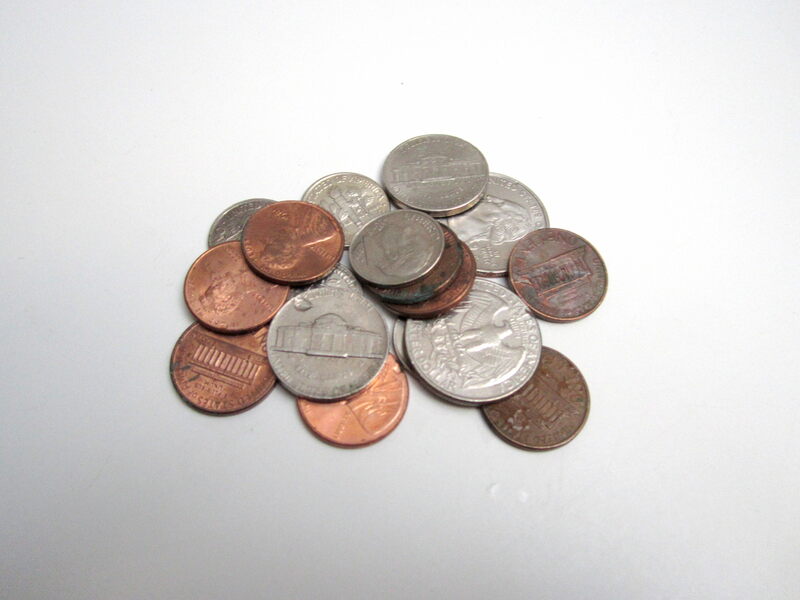 Sales definitely slowed down this week, but I still made some cash. 1. 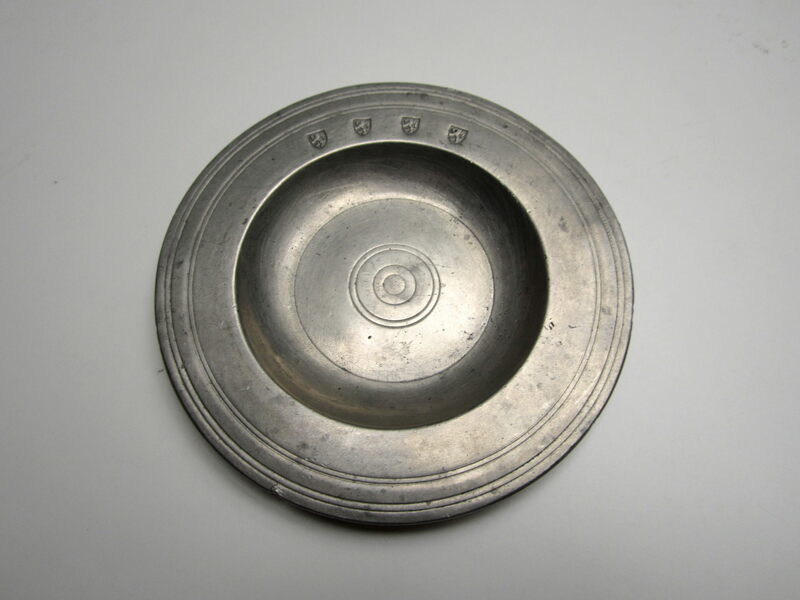 George Inn pewter dish: on eBay for 45$. Found late October in Mount Royal. It sold to a buyer in Japan. 2. iPod Touch: on Kijiji for 100$. I had this up for 120$, but the guy showed up with his kids and asked me if I’d take 100$ for it. He told me it was to be a gift for them. I have a hard time saying no to that, especially when speaking French. Still, I’m happy with that price. It was a very popular listing, receiving around six different replies in the span of a few hours. I sold it with the USB charger from last post. 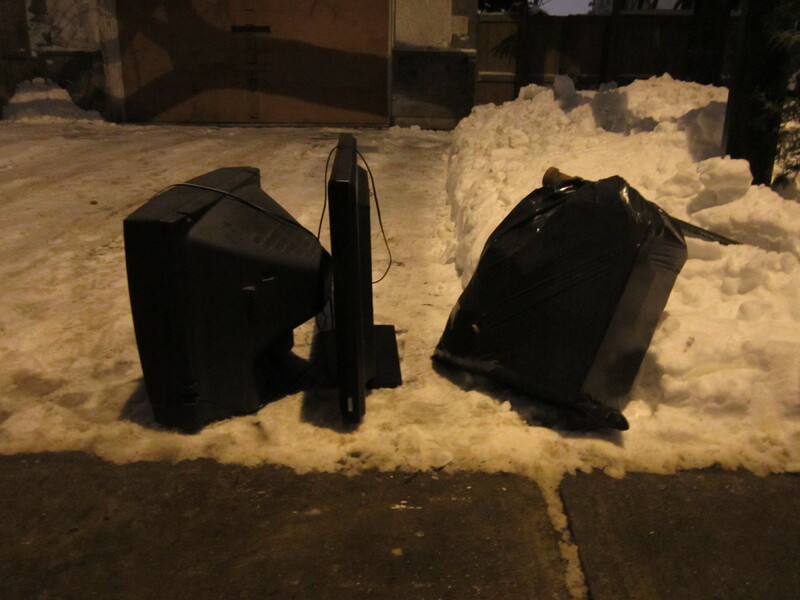 Found a few weeks back in Cote-des-Neiges. 3. Small change: liquidated at TD Bank for 22.50$. 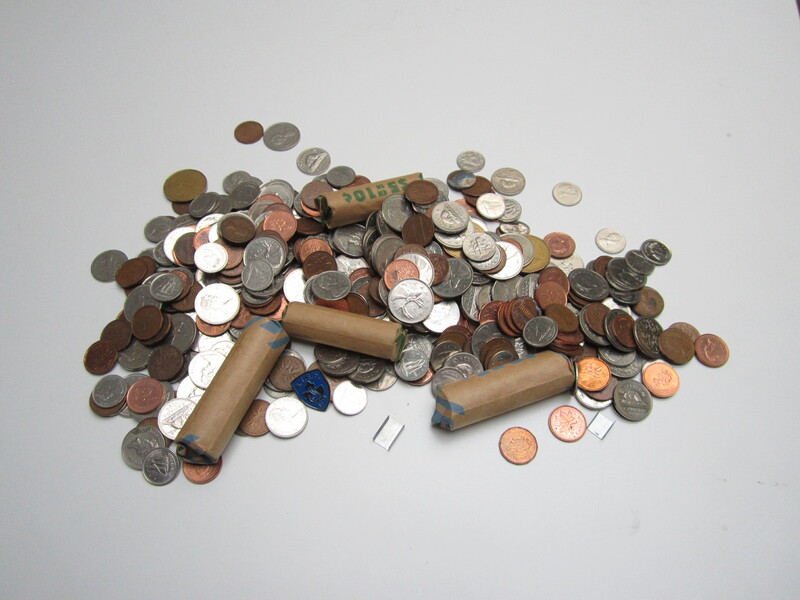 Much of this came from a big bag of pennies I found in Ville St-Laurent. Apparently there were over 1200 in there! Total: 187.50$, 9008$ since May 18th. A decent if unspectacular week. None this week! I’ll get back to listing this week or next. I definitely have some pieces to add to my stores. If you have a question, see anything that you’re interesting in buying, or to just want to say hello feel free to email me at thingsifindinthegarbage@gmail.com. I also enjoy reading your comments! Like “Things I find in the garbage” on Facebook! I was busy for a lot of last week preparing, packing, and shipping things I had sold. 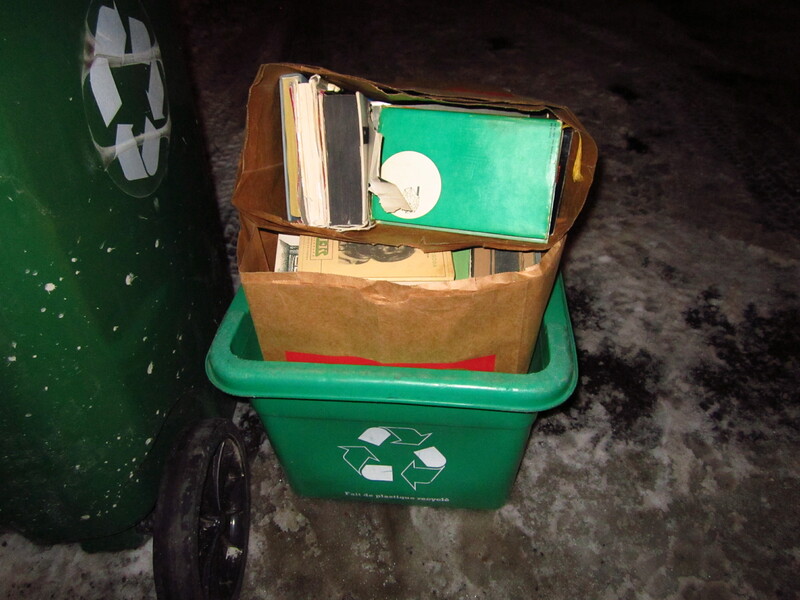 I try not to buy boxes – I usually take them from the recycling – but this time I caved and spent the few extra bucks. More on that, and a poor experience with the UPS store later. All this took away from my regular hunting schedule, but I still made it out for a few runs. I’ve been going to Cote St-Luc on Sunday nights for a while, but decided to take the night off after I struck out there last week. My first run of the week was to NDG, Snowdon, and Hampstead. 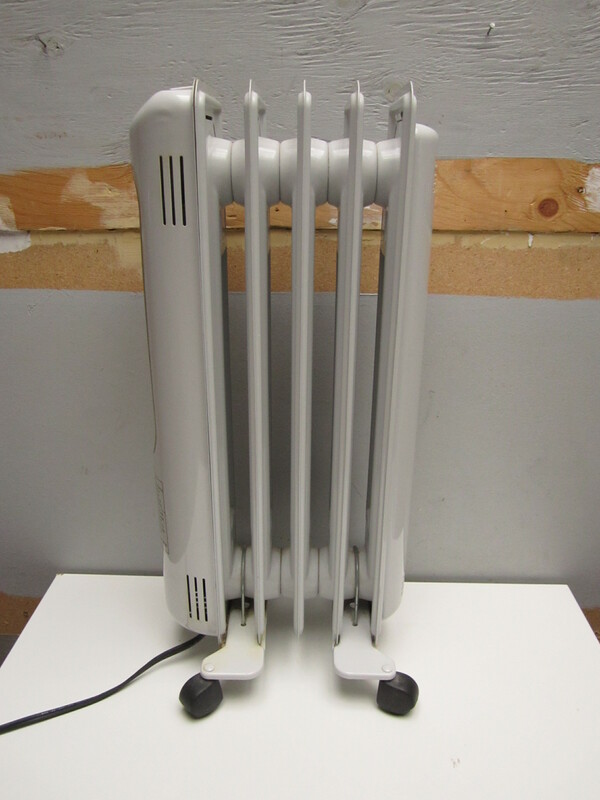 I came across this oil heater not far from upper Westmount. It works fine, and I put it up on Kijiji for 25$. Later on, I drove by this recycling bin and did a double-take. 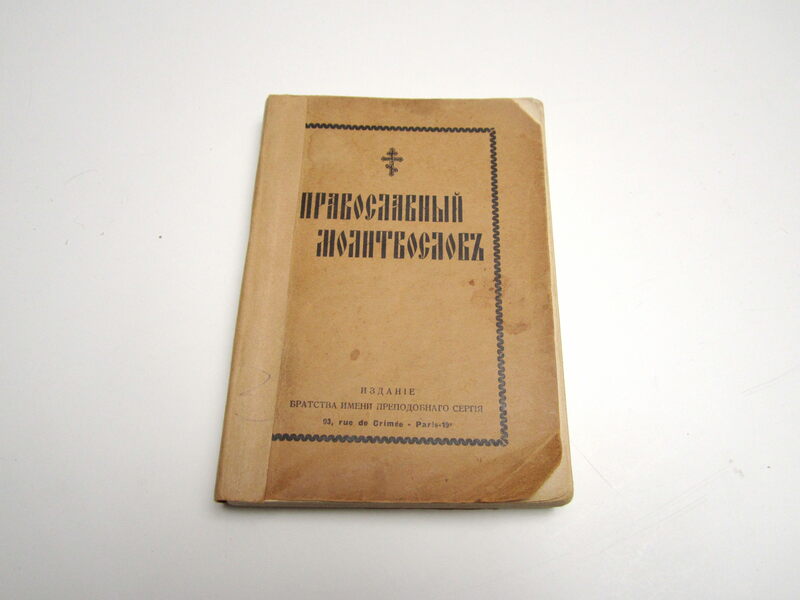 Inside the paper bags was a bunch of books, the vast majority of which were written in a language I couldn’t understand. I took some regardless. 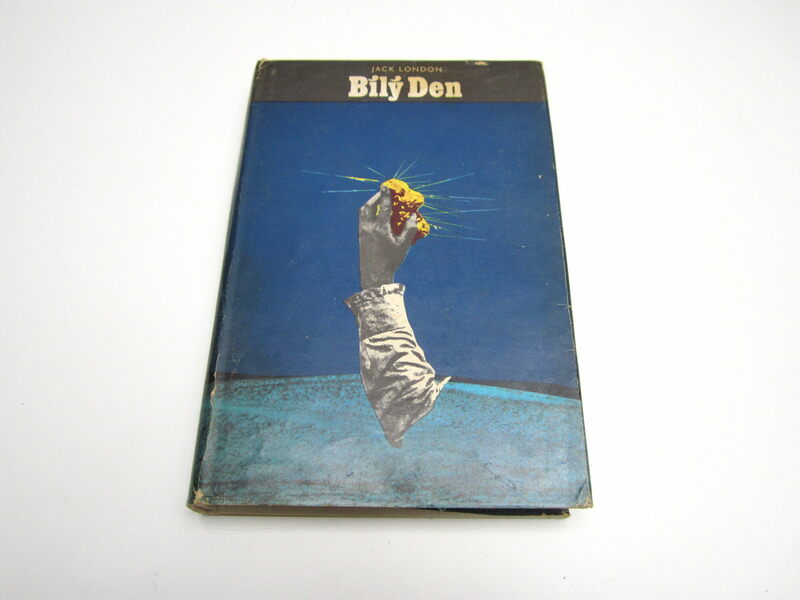 Many had pretty cool covers, and I know there is somewhat of a market for vintage, foreign-language books. 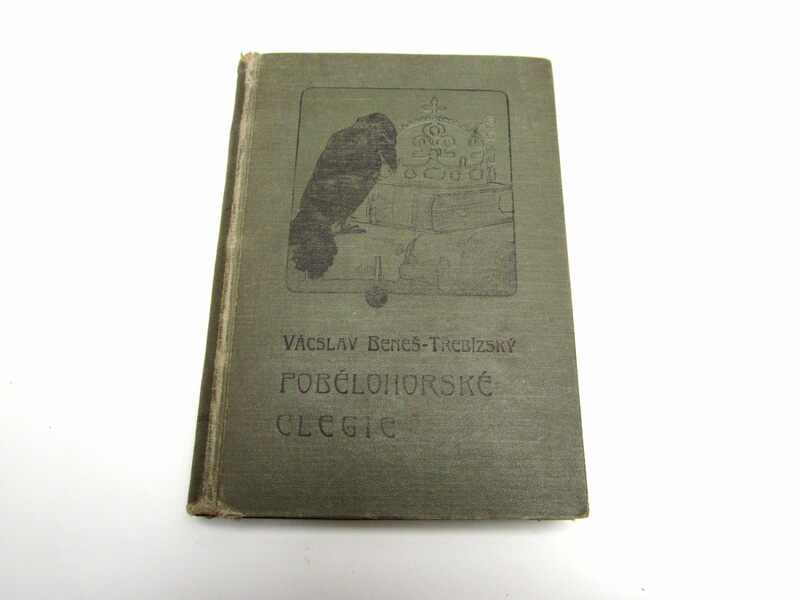 I was able to figure out the language (at least of some), mostly due to this Englesko-Hrvatski dictionary. 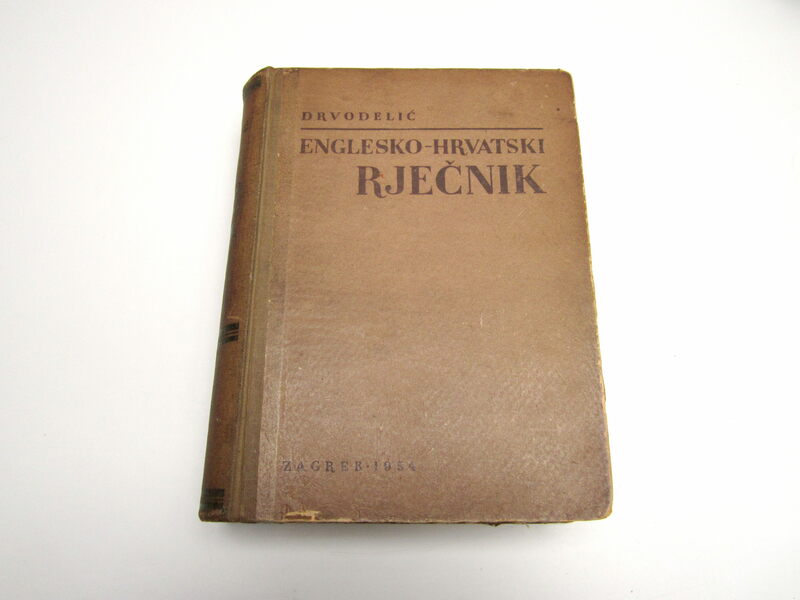 Hrvatski is the language of Croatia, Bosnia and Herzegovina, and some parts of Serbia. 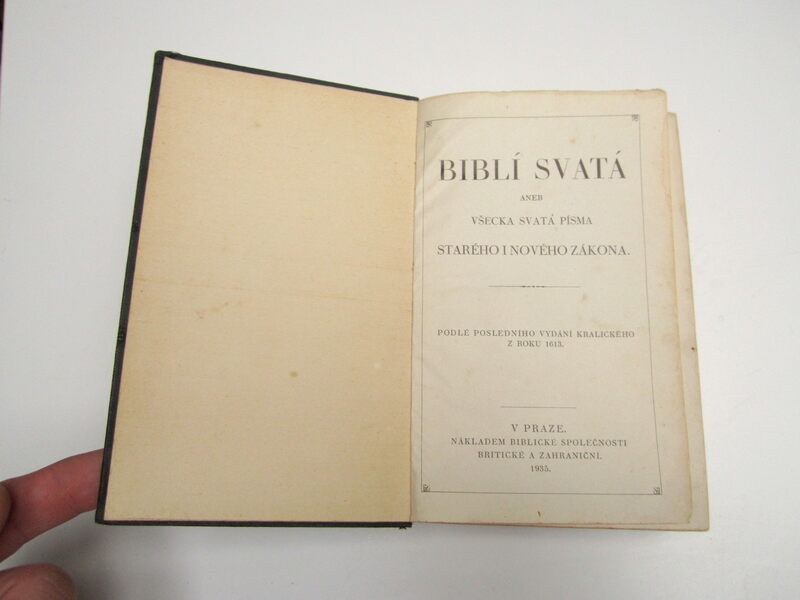 It was published in Zagreb, the capital of Croatia in the 1950s. I thought this Aldous Huxley book was particularly cool. 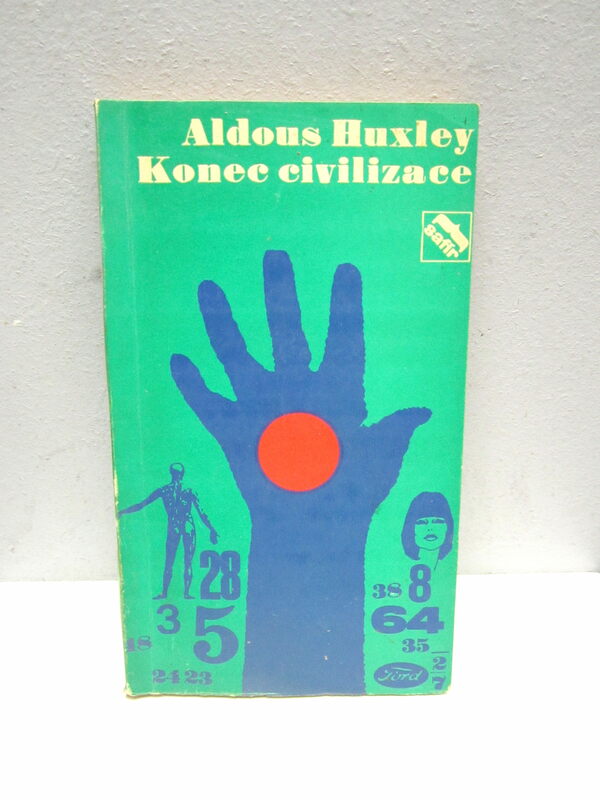 “Konec Civilizace” translates to “End of Civilization.” Huxley doesn’t appear to have a book by that title in English, but it could be a non-literal translation of a book like “Brave New World.” I wonder if I could get a bit of money for it. 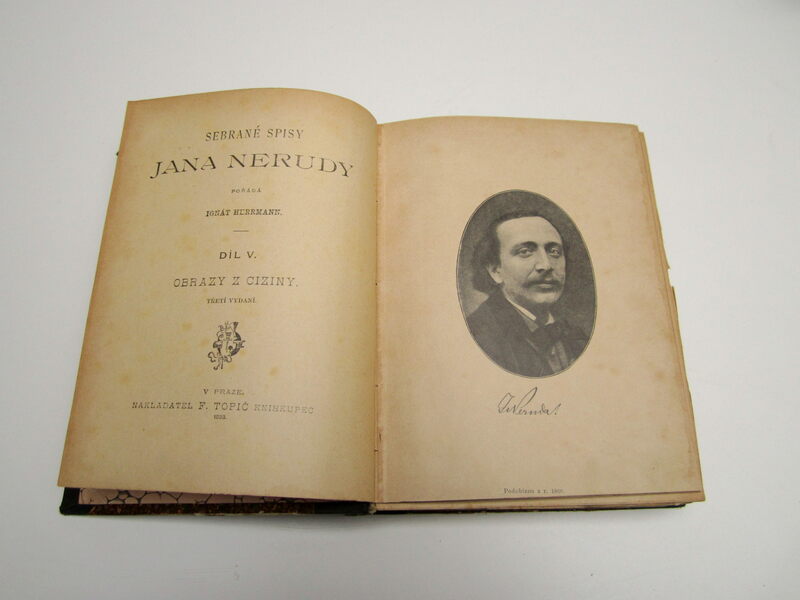 The oldest was a book by Jana Nerudy, published in 1893. 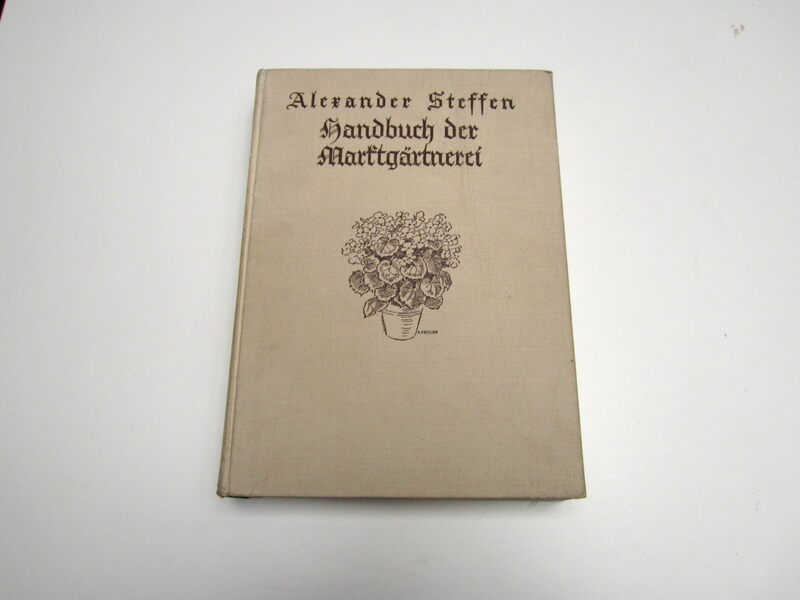 Another one of my favourites is a book of plants and flowers written in German and published in 1940. I went to Mount Royal on Tuesday night. I came across this big 40″ flatscreen TV and decided to take it home. I don’t usually bother with these types of TVs, as the broken ones are usually cheap brands that don’t even have much value for parts. However, this one was a Toshiba, which to my knowledge is a decent brand name so I decided to give it a shot. It has some issues with the screen, but it might be an easy fix according to some people on Youtube. If not, I’ll leave it on the curb for someone (hopefully more handy than I) to find. Not longer later I came across three golf bags, all full of clubs. None of the clubs looked spectacular, but I took the one set in front, thinking the bag itself might be worth something (it was vintage and made in the USA). 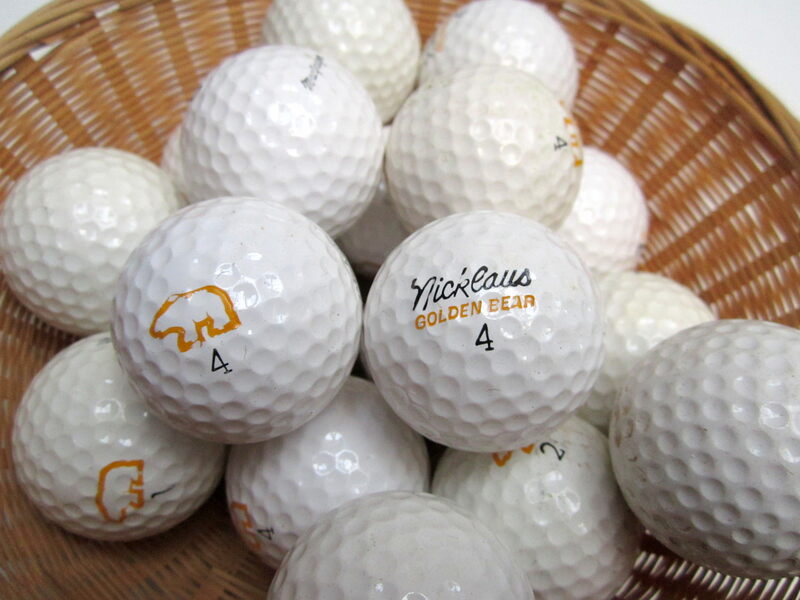 It didn’t end up being worth selling, but I did salvage a nice golf umbrella and a bunch of vintage Jack Nicklaus “Golden Bear” golf bolls, which I may be able to get a bit of money for. 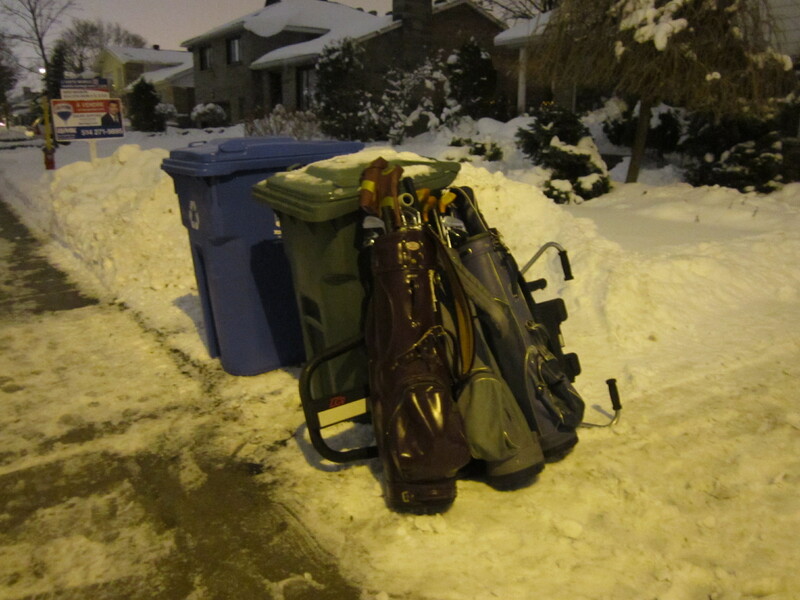 I left the bag and clubs on the street by my friend’s place, and they were gone before long. 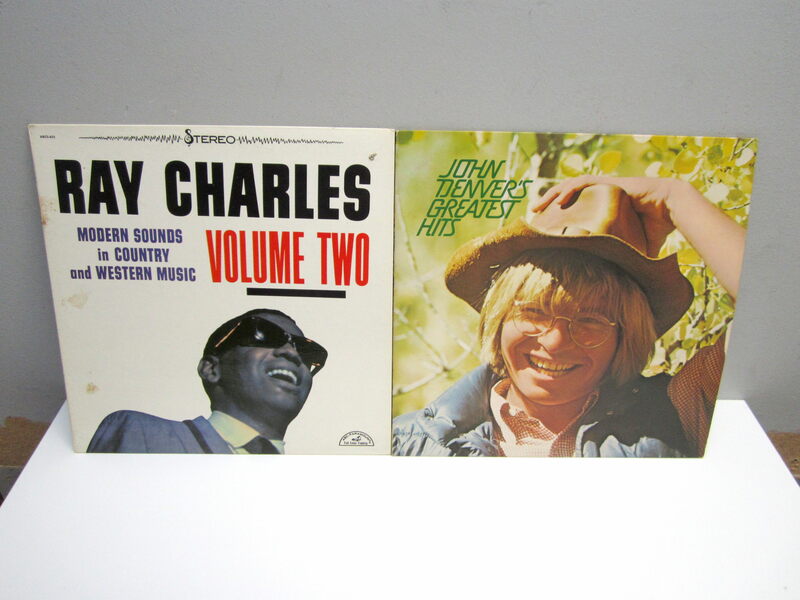 Later on, I opened up a promising-looking recycling bin and saw a stack of old records. 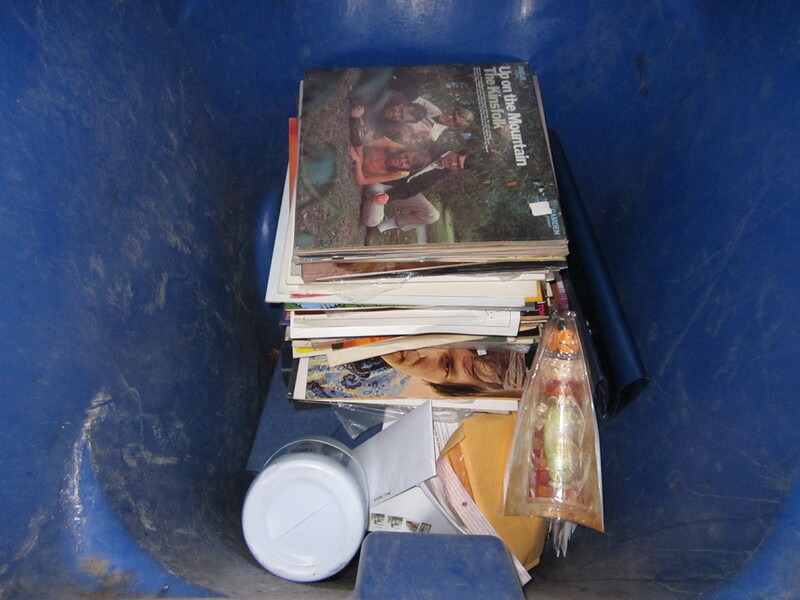 To my knowledge, records are not recyclable. 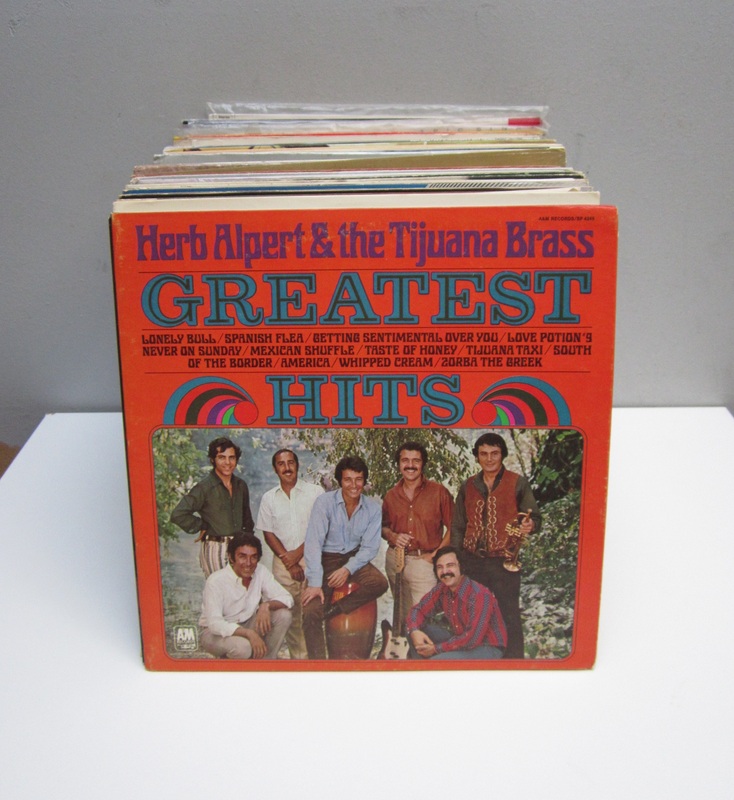 I took the lot, which amounted to about 50 records. 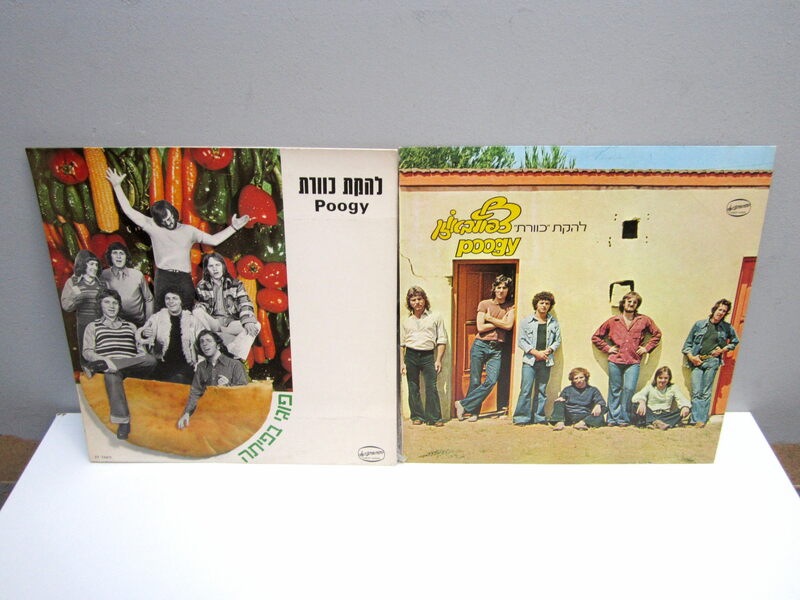 Many are by Hebrew bands (including a prog-rock band by the name of “Poogy”) and singers, and manufactured in Israel. 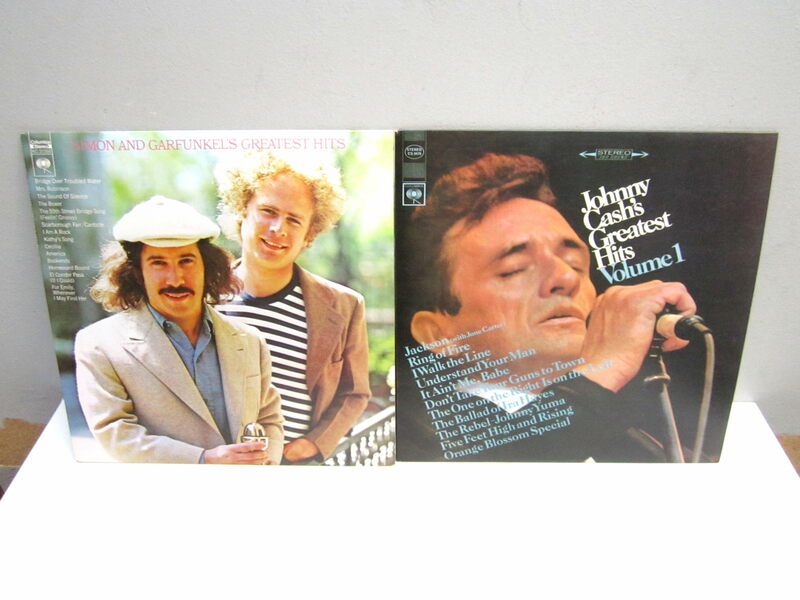 There were also albums by more familiar artists, such as Simon and Garfunkel, The Band, Johnny Cash, Ray Charles and John Denver. 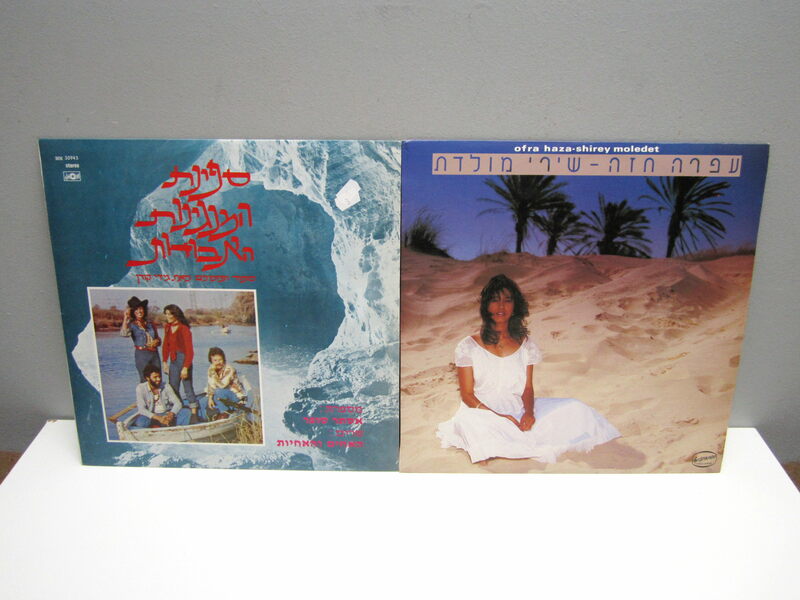 I’ll probably keep a couple, sell a few at a yard sale, and bundle the hebrew ones together to sell as a lot on eBay. 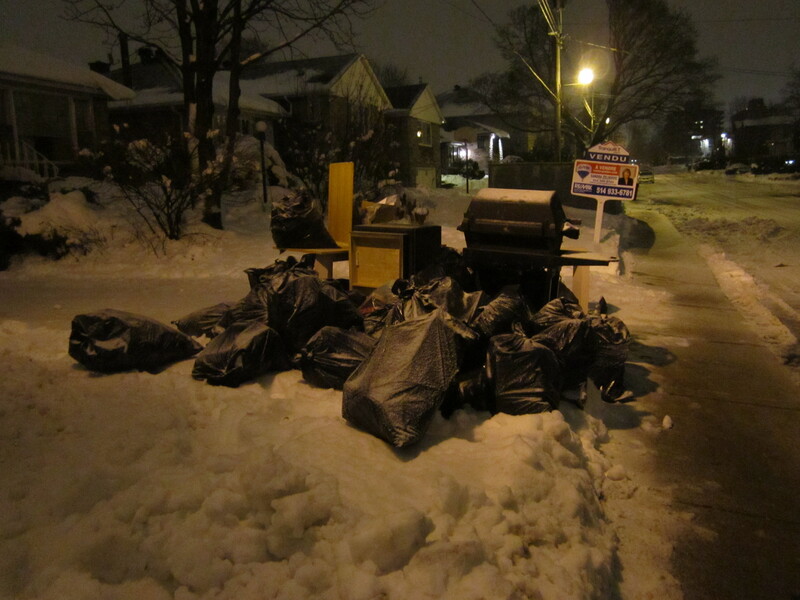 I was pretty excited when I saw this big pile in front of a recently sold house in Cote St-Luc on Wednesday night, but it turned out to be mostly a bunch of junk. I did save a few things, however. I thought the cover of this 1987 (the year I was born!) 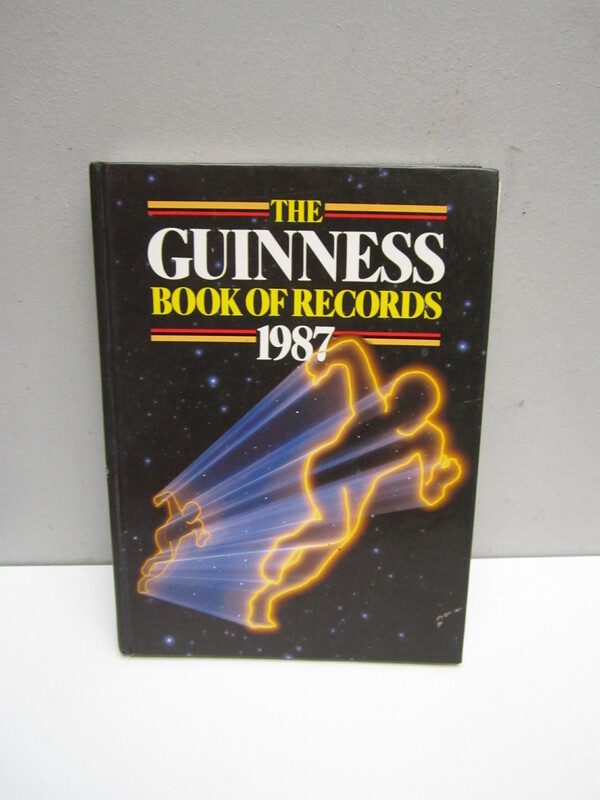 Guinness Book of World Records was pretty cool. I also saved this doll. 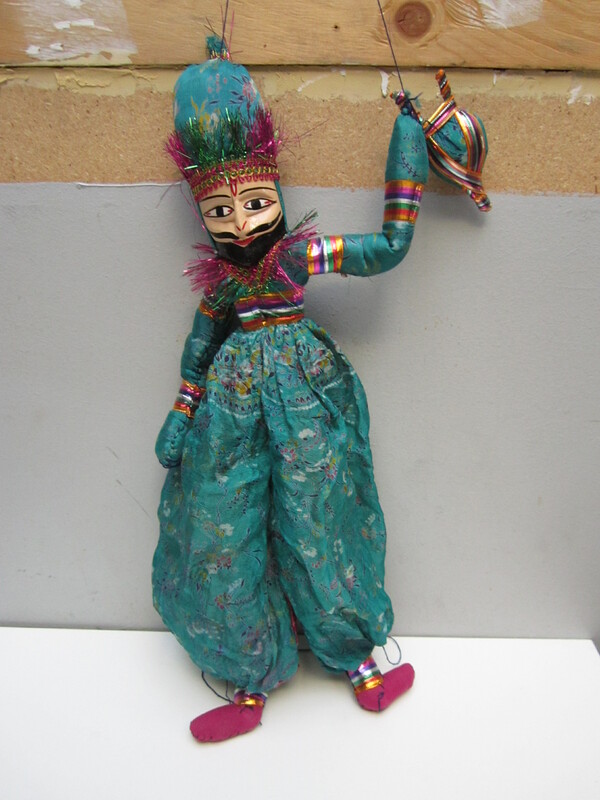 I’m not sure if it’s a marionette with missing strings, or something meant to be hung from the ceiling. 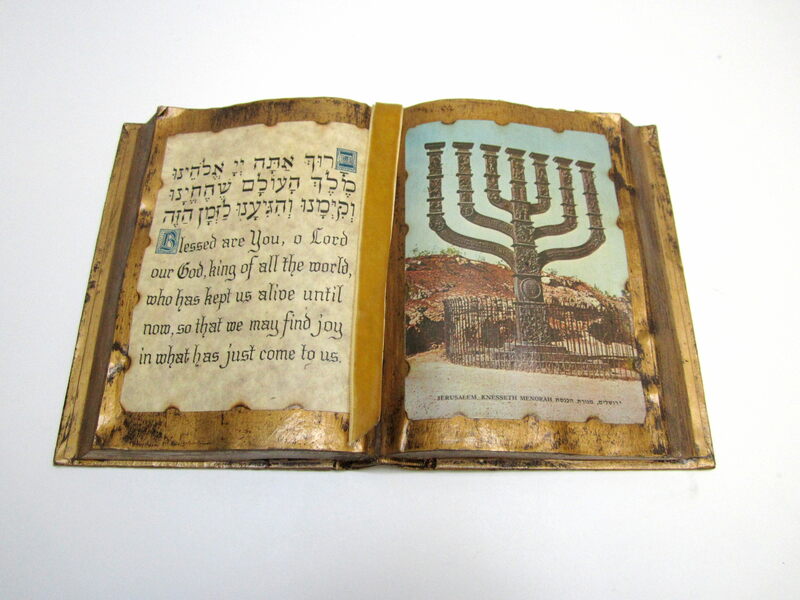 … and a decorative hebrew “book.” I’ve been finding tons of Jewish stuff recently! I went to a going away party on Thursday night, causing me to miss a planned Friday morning run. Instead, I took a walk with a friend in the eastern part of the Plateau in the evening. We didn’t find much. However, this one spot provided some small change (maybe 5$ in all), some tennis and golf balls, an iPod charger (I needed one of these, as mentioned in the last post! ), and a decent bike seat. It was a pretty quiet week overall, likely due to people being in a rush to get everything in order for the holidays. Sales, as a direct result, have been pretty decent! 1. 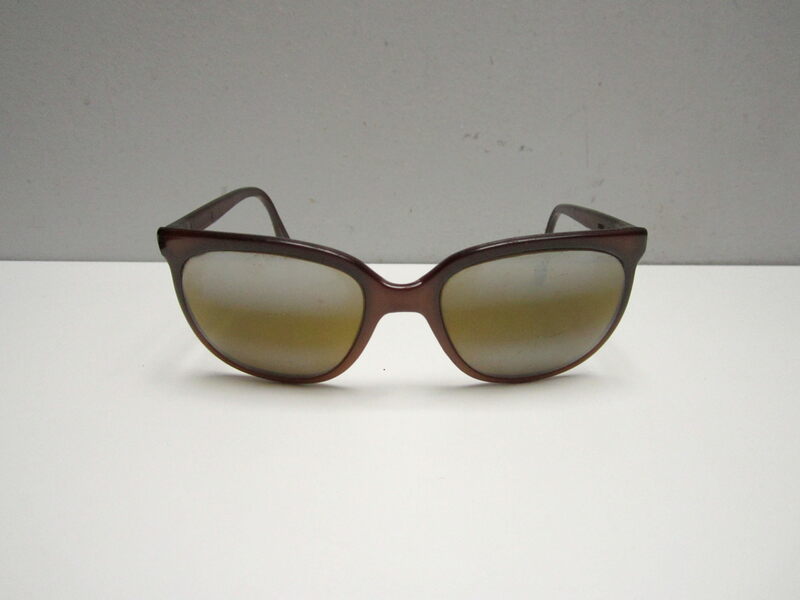 Vintage Vuarnet Skilynx Sunglasses (1984 Olympics): on eBay for 75$. Found late November in Mount Royal. 2. Lot of vintage hotel keys: on eBay for 50$. I’m happy to get this total. I know I could have gotten more selling them individually, but it would have been hours more work as well. Found in NDG and discussed in last week’s post. 3. Avon sterling silver spoon ring: on Etsy for 34$. I have another one exactly like it, which is now up in my Etsy store. I can’t remember where I found it, but it definitely came with one of my massive jewelry hauls in 2012 or early 2013. 4. 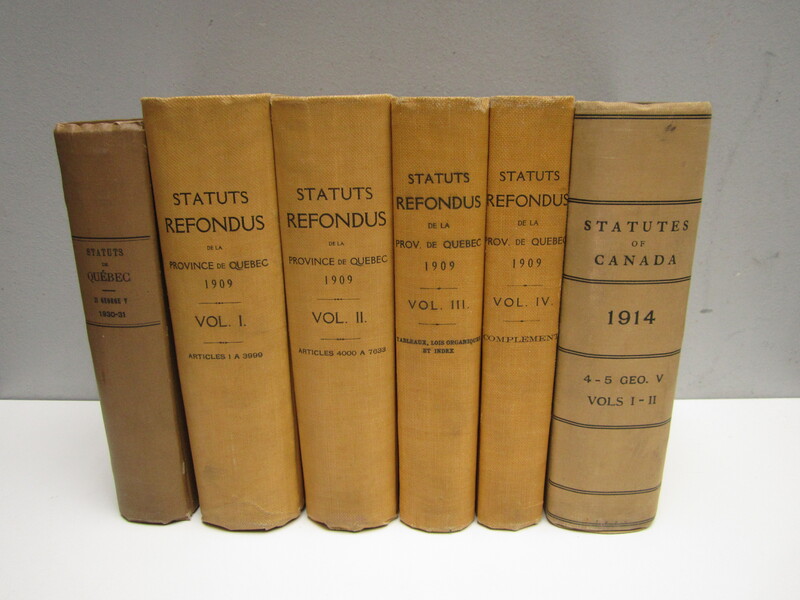 Five antique Quebec law books (Set of 4 from 1909, and one from 1934): on eBay for 80$. Found in Ville St-Laurent in early November. Refunds: 40$ (native mask). I noticed a few extra, minor defects when examining the item that weren’t there previously. I sent pictures and the offer of a minor refund to the buyer, and he was still interested. This makes the profit around 205$ instead of the 245$ listed in the last post. A nice profit regardless. Total: 214$ (including the refund), 8820.50$ since May 18th. A decent week. Sales slowed down towards the end, likely marking the end of the holiday boom. There was definitely a bit of a mad rush to my eBay and Etsy stores last week. In order to save myself a bit of time and hassle I decided to bring the books and the native moon mask (from last week’s post) to the UPS Store for packing. 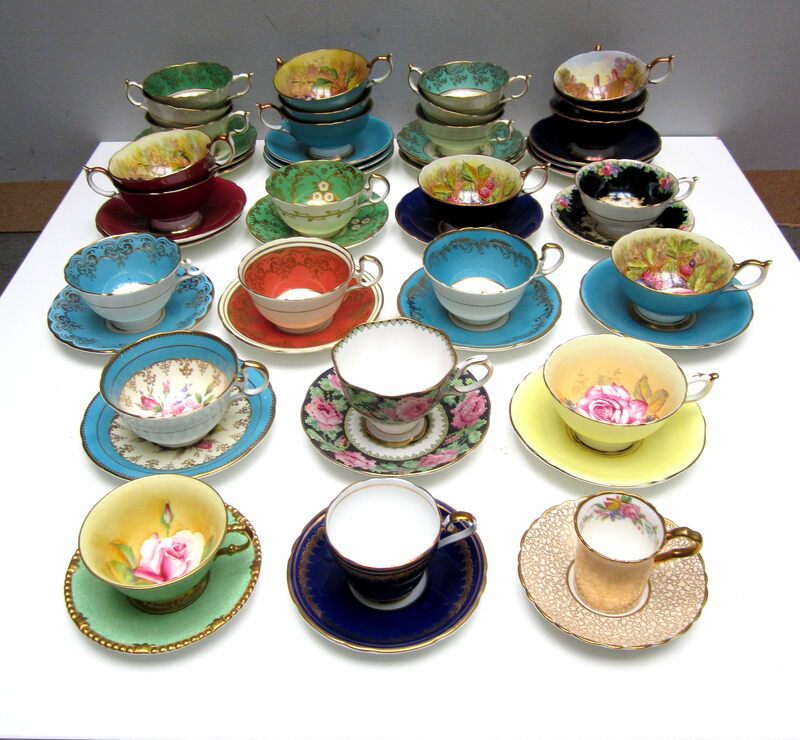 Last time I went (with the tea cups) I received very good service for a very fair price, and felt very confident in the packing that the employee did. This time, however was quite the opposite. I felt a bit suspicious of the person working there from the start. For one, she asked me to pick out the size of box I wanted to ship in, which I thought was a bit odd as it’s her job, not mine to know how to pack an item. I went along with the questionable requests for a while, but also became more and more suspicious. For one, I didn’t think that she had put much wrapping around the books, although I hadn’t watched closely enough to be sure. When it came to pay, she told me the price for packing and shipping was going to be 95$, about 80$ of which was for shipping. That seemed outrageous, since one package was barely leaving Montreal and the other was going to Toronto, both of which are cheap, one day deliveries by Canada Post. Based on this price, and my serious reservations about the pack job, I declined and paid just the 15$ for the packing, which was mostly the cost of the boxes and bubble wrap. I went to Canada Post, which was conveniently right next door, and I opened the boxes to see how they were packed. She had done an unbelievably bad job. The books had one sheet of bubble wrap around them, and were surrounded by half a box of empty space. She didn’t even put packing peanuts in there – there was nothing to keep them in place. The books would have just been rolling around inside the box. 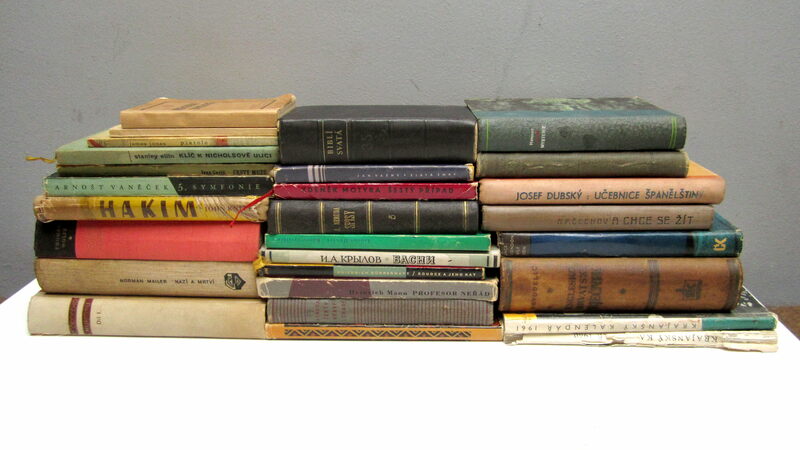 Books aren’t even particularly fragile, but I’m sure these would have been ruined or at least heavily damaged on even the short trip they were going on. The native mask was also packed poorly. She put a couple of pages of bubble wrap loosely around it, and then filled the box around half-way with package peanuts inside. The item would have moved a lot inside the box, and I felt had poor protection at the bottom. This one was less of a total disaster of a pack job, but I’m still not at all confident that it would have arrived at its destination unscathed. My friend Sarah was fortunately around to help me repack the items with some free newspaper (while being careful not to let it be in direct contact with the item, as that stuff tends to smear pretty badly) and some cardboard that happened to be lying around. I’m confident in the pack job that we did. To top it all off, guess what it cost to ship the items by Canada Post? 35$, or less than half what UPS (or at least this one person) was going to charge me. I’m not sure I’ve ever had such a night and day experience with a business. Last time it was very good, and this time was a near disaster. I’ll likely use the UPS Store again, but only with fragile and valuable goods, and only if certain people are working. The phone book is at a high price, but sometimes I do that with this things I most appreciate. I think that phone book is amazing, and if it were from Montreal I’d probably keep it myself. I think it’s possible to find a buyer at that price, and if not I can always lower it as time goes on.